I always approach writing self-assessments with bemusement, as writing about my work is totally dependent on my current frame-of-mind and emotional state when considering the work undertaken – it makes being objective somewhat difficult. No more so when considering one of the most important modules of this course, one which concerns itself with the development of my practice and ergo myself; how objective I can be in this regard is somewhat open to interpretation. I will however attempt to outline how I feel progress has been made and what I reflect accordingly. Firstly, I think the progress I have made this year in terms of developing my practice has been quite profound. Not only am I able to consider myself as having an art-focused practice, but I am even comfortable promoting it as such – a marked change from this time last year where I was still unsure of the direction I should take. I feel this is due to a continued interest in photography as a means of self-exploration and understanding and art in general. As such I have taken great care to ensure the tools I am using to promote my practice (web, social media etc.) reflect an approach cognisant with an arts based practice. That being said, I still have work to do in engaging further with these tools –associations with professional bodies and organisations is something I need to seriously consider, in addition to social media connections specifically associated with the arts. However, I am very aware that having fingers in too many pies might dilute my focus, so again a cautious approach and carefully selection of such tools will be needed. I think if anything, this module has helped me focus my attention on how important self-promotion is but also that it has to be focused and targeted to benefit my practice. Who am I? #4 Warren Fournier ©2014-15 – Knowing yourself & your practice was a key focus of the Professional Frameworks III Module. Secondly, I have decisions to make in terms of either trying to make a go of working as an artist or seeking a paid position with an art based organisation. For the former this means funding and selling my own work to fund projects and collaborations, something I am already investigating. There is also the possibility of installing myself as a self-employed artist, producing work on a commission basis, but this is something that I feel would require an organic evolution, gaining clients over time and allowing my practice to evolve naturally in this direction. The other is a somewhat unknown quantity as I can hardly apply for roles until I have finished my studies and again careful consideration of the type of organisation and role will need to be researched. Again this module has been successful in focusing my thoughts on such things and some of the guest speakers, especially Paul Herman from Redeye, helped me understand the various challenges of anyone entering an art based practice – having this kind of engagement was useful in helping plan for mitigating such challenges. PFIII was instrumental in thinking beyond mystudies. Collaborations with other artists like the one I have planned with Fraser Radford (www.fraserradford.com) are the result of this. Additionally, the module has be invaluable in focusing my attention on conceiving and producing some very important and valuable tools – A printed Portfolio, Business Cards and Postcards. The experience of putting these three elements together was an enjoyable and challenging experience as it made me consider very carefully my practice, how I wanted it portrayed as well as who my audience were. The outcome of this was three elements that I feel proud of and represent the culmination of the past three years in terms of building my practice. In addition, I have gained a perspective on myself and my work that I would have struggled to find otherwise. Business cards, postcards, a Printed Portfolio and Website were valuable additions to my practice. Finally, I should like to mention something that has had a marked impact upon my work and studies – depression. It is something which I have lived with for many years and for the most part it is something I have learned to cope with and deal with. However, that isn’t always the case and so it was for the start of the second semester. Although my coping methods came into play, sometimes the severity of my condition can affect my efficacy and perspicacity; this meant a slow and very considered approach to work, prioritising my work in terms of importance. I also had to focus on other module work and as such some of the work I had intended to undertake had to be side-lined or scrapped. Although this might seem like I am looking to excuse myself for not doing work or gain sympathy in light of my condition nothing is farther from the case – truly if this were so I would have sought a support plan or similar. I relate this because I am staunch in the belief that good work comes through strife, and adversity is sometimes an advantage rather than a handicap. In this case it has meant a careful examination of what work is essential and which is not and where best to focus the limited energies I had to complete that work. Ultimately, knowing where and when to make sacrifices, in order to ensure the best possible outcome was not dissimilar to the development of a photographic project. Emergence: Approaching Silence, Warren Fournier ©2014-15 – Depression plagued me during the latter part of the PFIII module and while this might have set me back it mere;y hampered my efforts to cram as much in as I’d have liked. Instead, it helped me focus my energies on what was important and vital for a succesfull submission. My last word would be that Professional Frameworks III has offered and delivered more than I anticipated and in return I have gone beyond what I expected I could and delivered something that hopefully has merit. One of the key values of the professional Frameworks Modules is that of practice progression, pertinently with Professional Frameworks III this means demonstrating a willingness to engage further outside the bounds of academia and push my work further afield – On-line and printed portfolios, business cards and collaborations all play a role in doing this. In addition, another way of testing my practice mettle is by submitting work to competitions and festivals -in fact we were actively encouraged to enter as many competitions and festivals as we could. 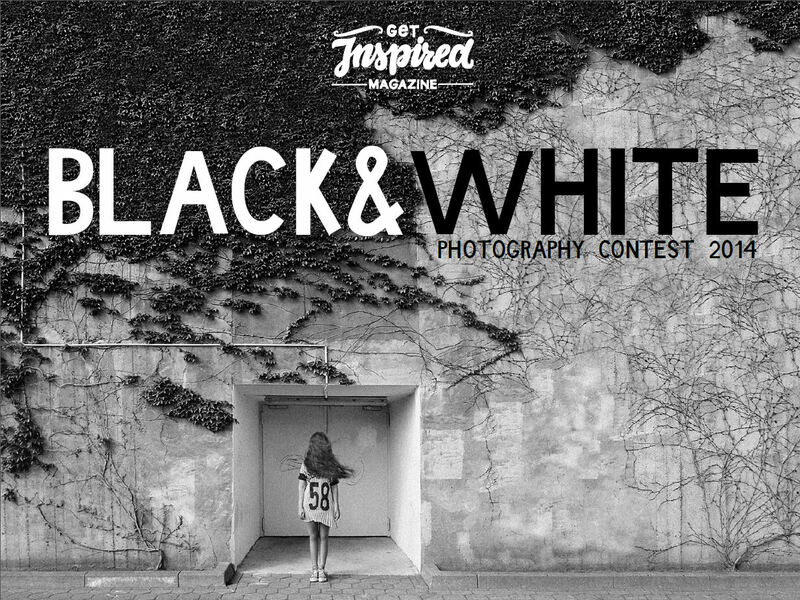 Get Inspired Magazines’ Black & White 2014 Photography Contest. 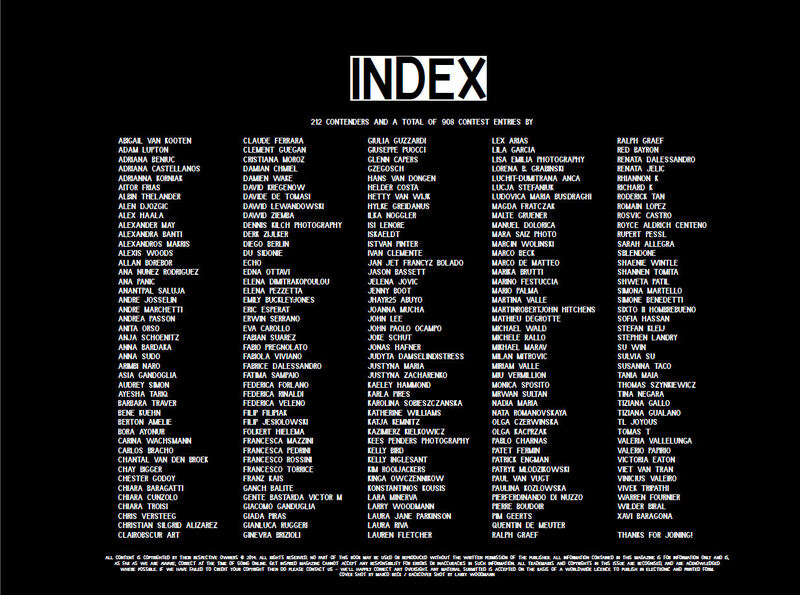 List of all entrants featured in the magazine. One of my three entries to the contest. My work as featured in the magazine. Neo Artists organisation run a biennial international arts prize. 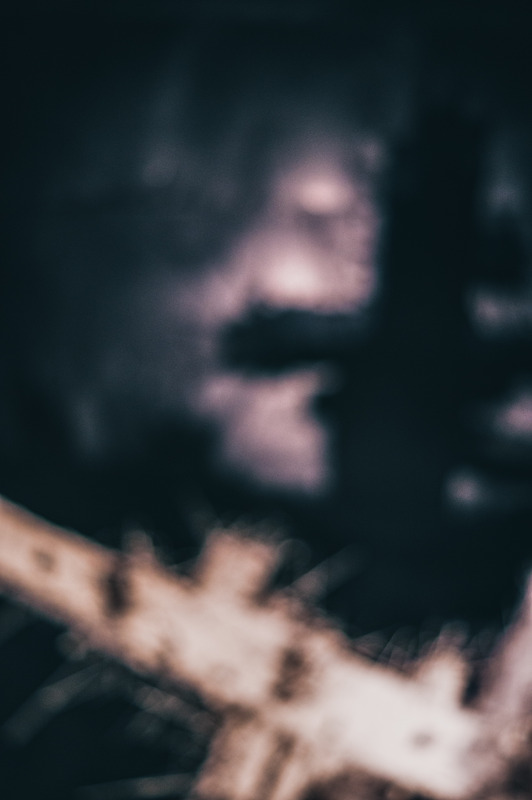 the Neo: Artprize 2015 is a Biennial international artprize run by Neo Artists an artist led, not-for-profit organisation, founded to aid the development of creative practitioners. I feel both the organisation and my work would dovetail perfectly with the competition and is a perfect opportunity for me to place my work in an arena in which I am interested. Entry fee is £15 for two pieces of work The prizes include £1500 for the winner along with 20 week artists residency and solo show, definitely something worth participating in. 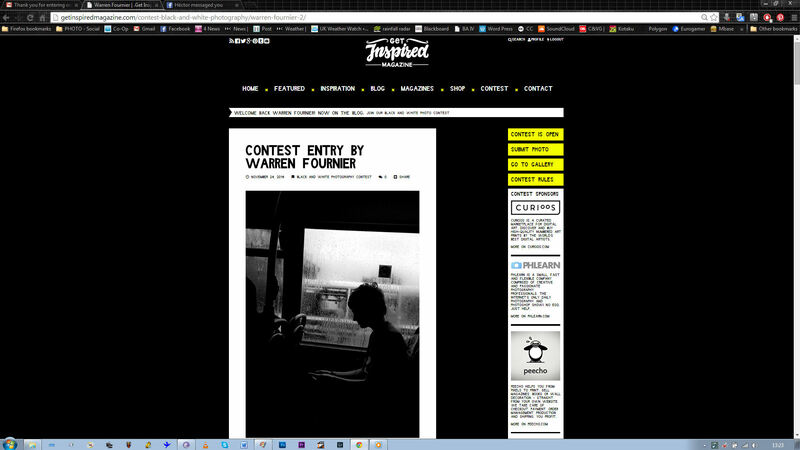 I’ve yet to select work for this competition but I have a good idea of what I would like to put forward. 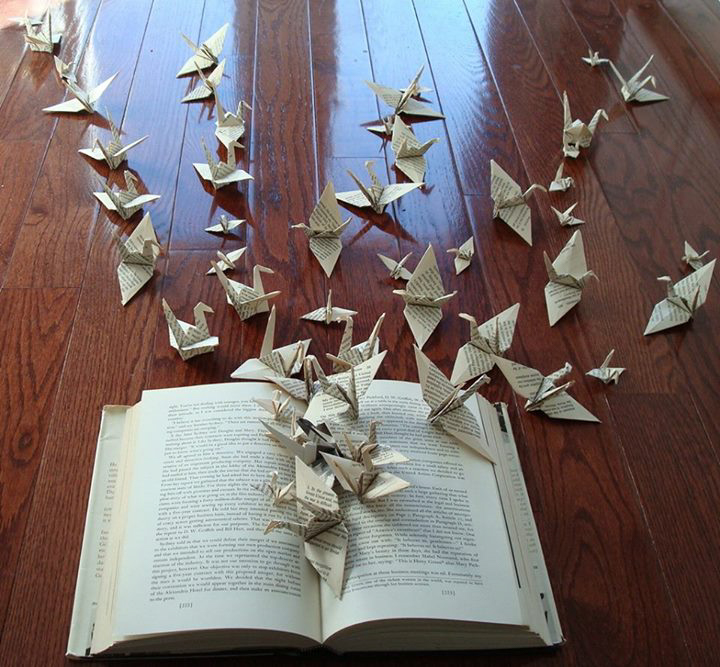 I;m quite excited about entering do the work I put forward will be what I consider to be my best. 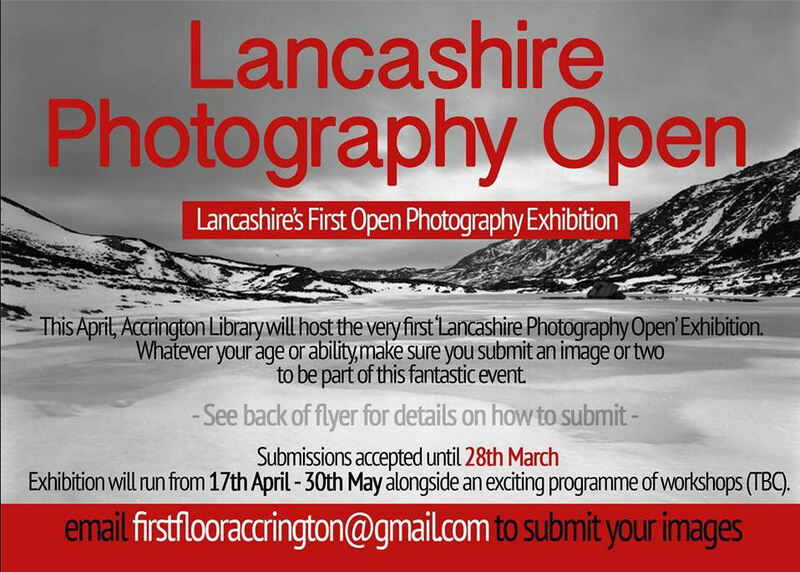 The 1st Lancashire Photography Open. A somewhat tentative move towards placing my work in a wider context comes in the form of a regional Photographic Open at FirstfloorAccrington – A regular venue for regional art and culture events.I have two images accepted to this open and will show from the 17th Of April Until May 30th 2015. It is a small start but valuable experience and a chance for me to make a few new contacts and begin the dreaded task of networking. Who Am I? 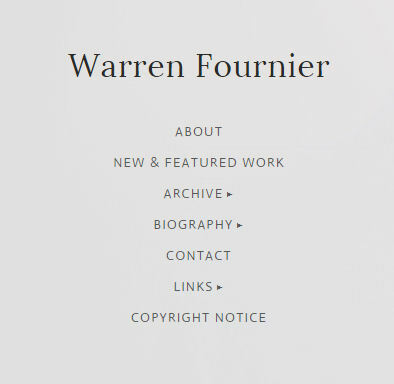 #4, Warren Fournier © 2014-15. One of the two images which will be on show as part of the Lancashire photographic Open. Although this may not seem to be much of an involvement with competitions and festivals, for me it is quite a large step and one I gave been happy to take slowly. I think a slow but sure approach with careful selection of this type of interaction is something that will benefit my practice. That said there was a festival I really would have loved to participate in – The Belfast Photo Festival 2015 however despite the entrance fee being within my viable range the cost of producing work (printing/framing etc) and providing insured shipping should my work be succesful was far too prohibitive. It’s a shame that new practitioners such as myself have these obstacles to overcome but for me I have limited funds available to me as a full-time mature student. Still, if I can move my practice forward such issues won’t be so much of a problem in the future. Being just one part of the several requirements for this module, and at first glance not one to cause too much in the way of extensive work. However, looks can be deceiving and with hind-sight I would say this element along with the business cards were the most intensive in terms of work input, short of the blog work which always accounts for the most time. This was an element of the module that needed be considered carefully, as the printed portfolio was something that needed to accurately represent my practice direction and ultimately it needed to appeal to my target audience. It was also something I had not yet done for myself and was a great opportunity to kill two birds with one stone. In addition, I already had work I knew I wanted to include in my portfolio, but I also wanted newer work and work that I had yet to fully develop but was representative of the work I was now involved and interested in to also be included. So how did I go about bringing this element to fruition and to a state I was happy with? Select only the best images. Images should be representative of my fine-art practice only. A4 images only, A3 being too large to be easily portable. colour or black and white no mixed portfolio, too jarring when viewed together. 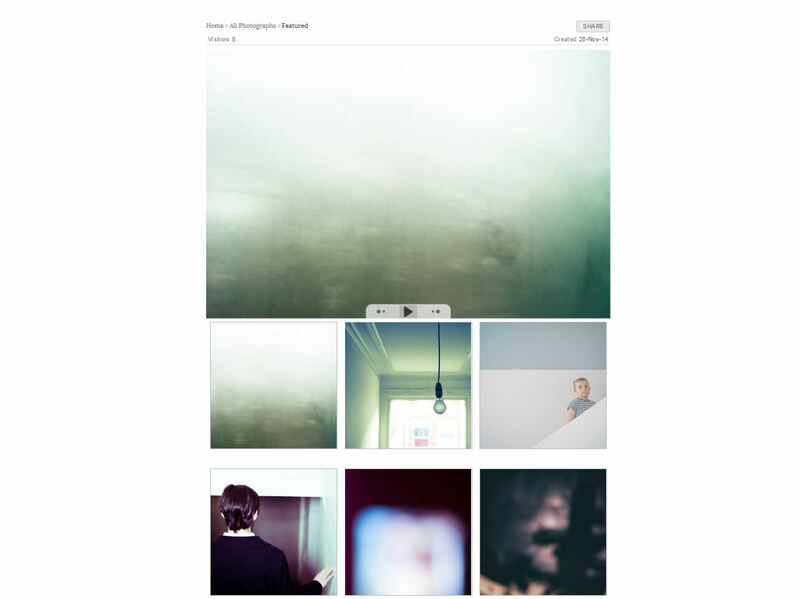 The online portfolio can act as a means to view the format I do not include. The presentation means must display my work in the best way possible: It must also be easy to view the work in either portrait or landscape orientation. It should also be easy to handle the individual work to allow it to be passed around, for the means of group presentation and review. It should also reflect the type of audience my work is aimed at and also reflect the type of practice I am entertaining. The type of printing and print finish should be considered carefully, so that my work looks as good as possible and is disseminated appropriately to the nature of the work. That appropriate protecting pockets be used to show off the work as well as possible but to also protect the prints. That the means of presentation be flexible to easily allow future additions or versions of my portfolio to be put together. The Mis Document stated 6-15 printed images were to be used in the portfolio, however during the two semesters of the course there appeared to be some flexibility in this requirement. Firstly we were told, that at least 6 images should be new work, not attached to any previous university projects, this was fine as I had intended to use some new work anyway. Then later we were told we could have up to a maximum of 20 images but at least 6 should be new, again this suited my purposes as it allowed me just about the right amount of images I wanted to include. Then another change, where we were told the 6 new images had to be new and shot specifically for the module, this new change seemed to go against the original tone of the MIS documents intentions – The MIS was after all the guide to which we would be marked against and this last change seemed at odds with that benchmark. Needless to say clarification came in the form of a reiteration of the original MIS documents intentions, albeit that work could be existing and/or new and have been shot specifically for the module or not. For me, this meant that my plan for new, currently in development work and existing work would be fine for this purpose. 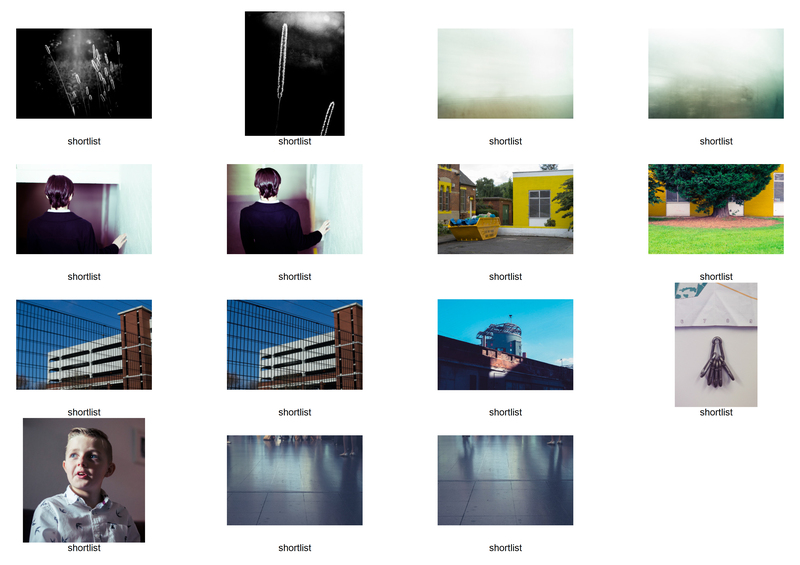 Prior to the conflicting information and close to the end of the module I had already split my potential portfolio work into two categories – New & Existing, although for the purpose of the actual portfolio they would be no such visual distinctions. 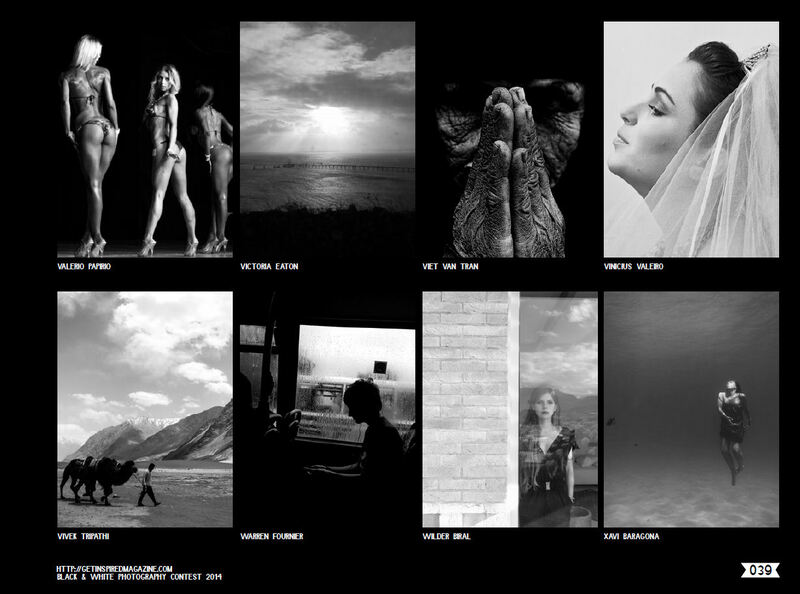 Contact sheet 1 of New/Recent possibles for my portfolio. 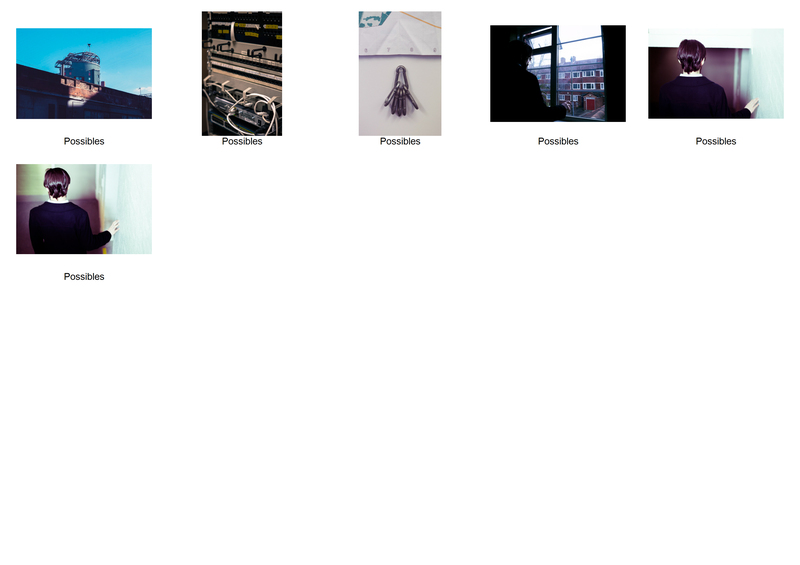 Twenty-six possible images was rather too many to be dealing with, I needed to get this to a more manageable amount. 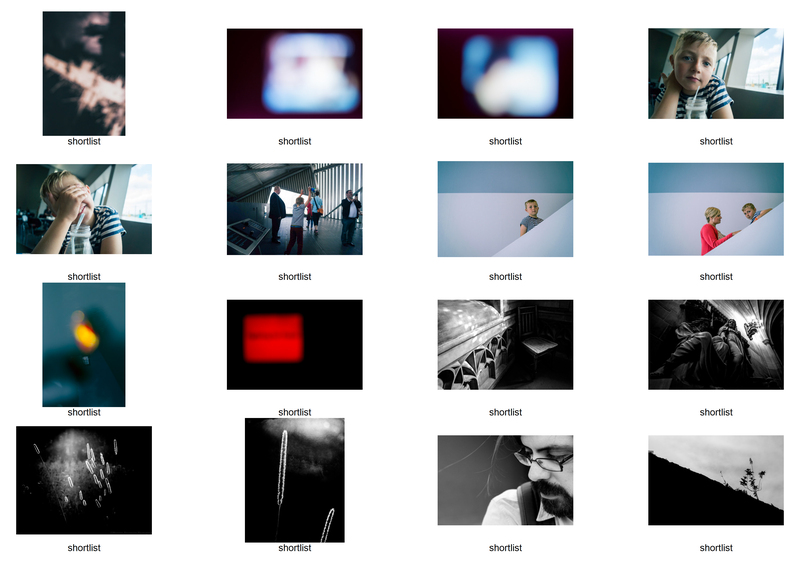 A shortlist of the images I felt were the strongest for the portfolio. However at this stage I already knew which ones I wanted. Untitled #1 Warren Fournier ©2015 – The first of two images from new series of work in progress, dealing with visual and personal thresholds. Untitled #2 Warren Fournier ©2015 – The second of two images from new series of work in progress, dealing with visual and personal thresholds. Nape #1 Warren Fournier ©2015 – A short set obliquely expressing abandonment or reproachfulness. Nape #2 Warren Fournier ©2015 – A short set obliquley expressing abandonment or reproachfulness. My Grandmother’s Shoes #1 Warren Fournier ©2015 – A short series dealing with time thresholds and nostalgia. My Grandmother’s Shoes #2 Warren Fournier ©2015 – A short series dealing with time thresholds and nostalgia. 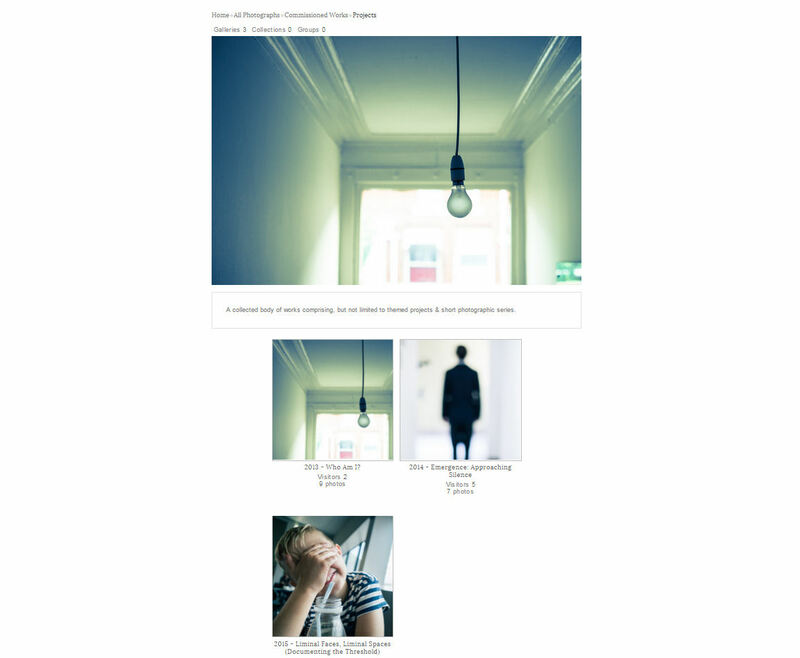 Here (above) are the final six new/recent images I was including in my portfolio. For me they clearly demonstrated an area of focus that was attuned to reflexive photography, carefully considered framing and subtle use of colour and tone to allow for some unique visual thresholds to be shown. In addition, I feel that the images fit well within a fine-art practice and also demonstrate my progression in this regard. Betwixt & Between the Defining Space (unresolved) #1 Warren Fournier © 2015 – A series of self-portraits, albeit lacking a traditional subject. The series examines the notion of the emotional self – the images are via reflexive responses to objects and scenes that trigger emotional response or resonances. Betwixt & Between the Defining Space (unresolved) #2 Warren Fournier © 2015 – A series of self-portraits, albeit lacking a traditional subject. The series examines the notion of the emotional self – the images are via reflexive responses to objects and scenes that trigger emotional response or resonances. Betwixt & Between the Defining Space (unresolved) #3 Warren Fournier © 2015 – A series of self-portraits, albeit lacking a traditional subject. The series examines the notion of the emotional self – the images are drawn via reflexive responses to objects and scenes that trigger emotional response or resonances. Betwixt & Between the Defining Space (unresolved) #4 Warren Fournier © 2015 – A series of self-portraits, albeit lacking a traditional subject. The series examines the notion of the emotional self – the images are drawn via reflexive responses to objects and scenes that trigger emotional response or resonances. Betwixt & Between the Defining Space (unresolved) #5 Warren Fournier © 2015 – A series of self-portraits, albeit lacking a traditional subject. The series examines the notion of the emotional self – the images are drawn via reflexive responses to objects and scenes that trigger emotional response or resonances. 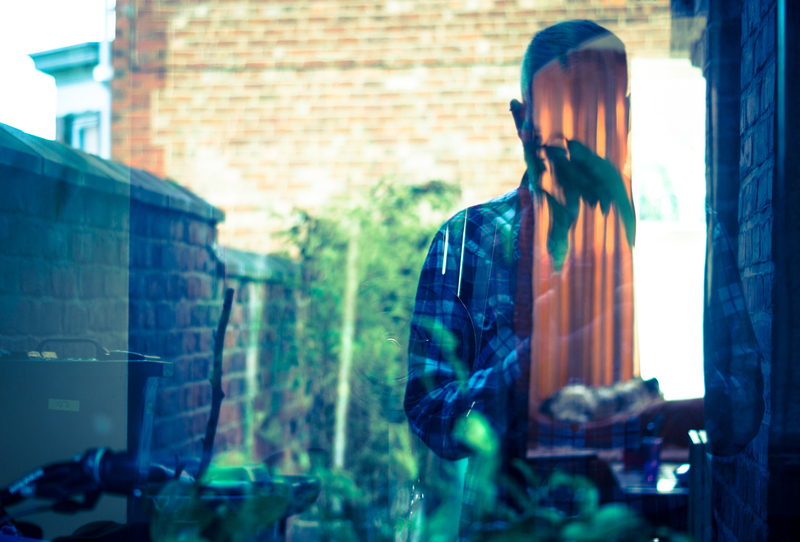 Betwixt & Between the Defining Space (unresolved) #6 Warren Fournier © 2015 – A series of self-portraits, albeit lacking a traditional subject. The series examines the notion of the emotional self – the images are drawn via reflexive responses to objects and scenes that trigger emotional response or resonances. emergence: Approaching silence #1 Warren Fournier © 2014-15 – Approaching Silence – A series bringing to light the sense of limbo that a dark emotional state brings about, the search for a way out and an implied emergence into light & peace. emergence: Approaching silence #2 Warren Fournier © 2014-15 – Approaching Silence – A series bringing to light the sense of limbo that a dark emotional state brings about, the search for a way out and an implied emergence into light & peace. 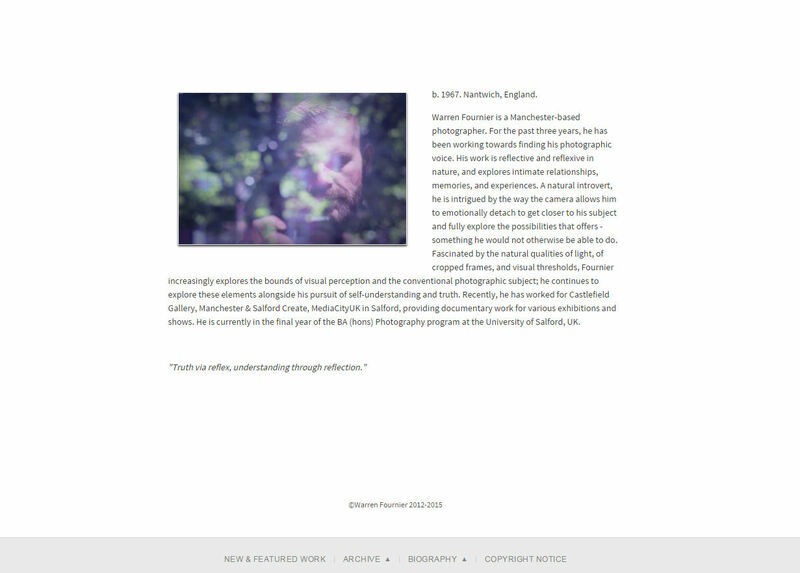 Liminal Faces, Liminal Spaces:Documenting the Threshold #1 Warren Fournier © 2014-15 – Taken from a reflexive and reflective body of work examining the notions of liminality and thresholds regarding person and place. This body of work accompanied my final year dissertation which used Arnold Van Gennep’s Theories on liminality in ‘Rites de Passage’ and also of those of Victor Turner who describes liminality as a “Betwixt & between” state. 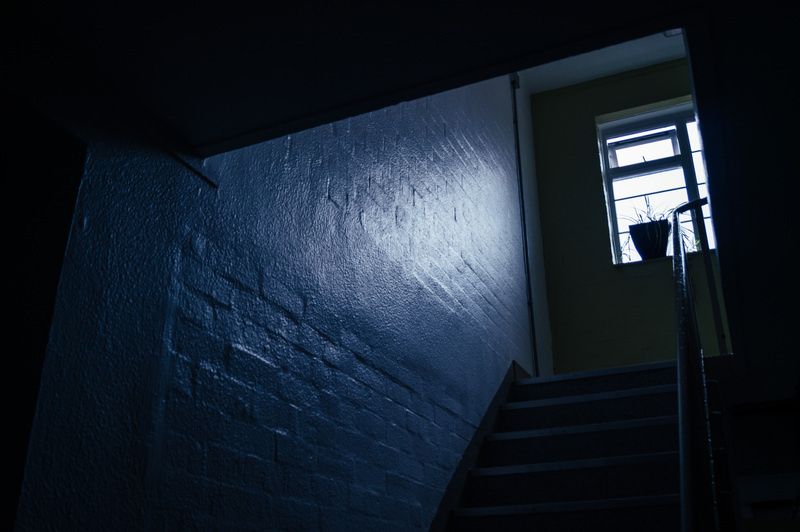 Liminal Faces, Liminal Spaces:Documenting the Threshold #2 Warren Fournier © 2014-15 – Taken from a reflexive and reflective body of work examining the notions of liminality and thresholds regarding person and place. This body of work accompanied my final year dissertation which used Arnold Van Gennep’s Theories on liminality in ‘Rites de Passage’ and also of those of Victor Turner who describes liminality as a “Betwixt & between” state. 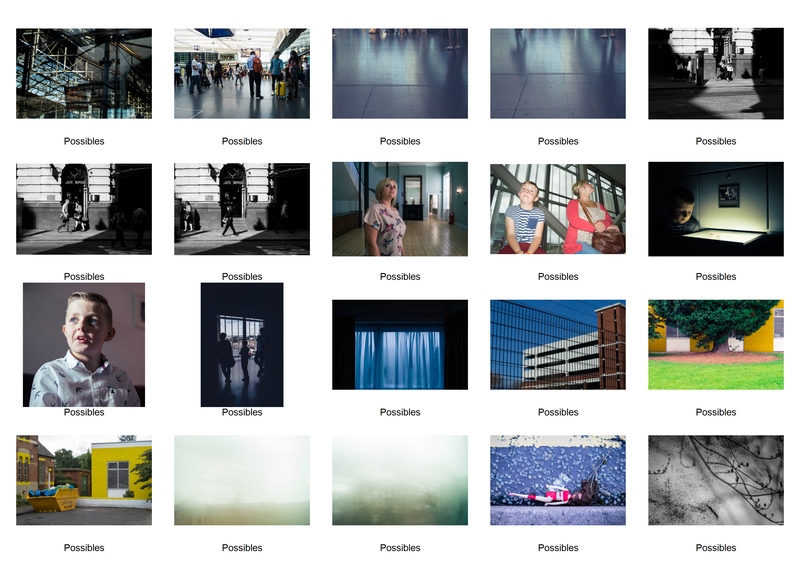 Here then were my 14 images and along with the 6 brand new images, making 20 in total. 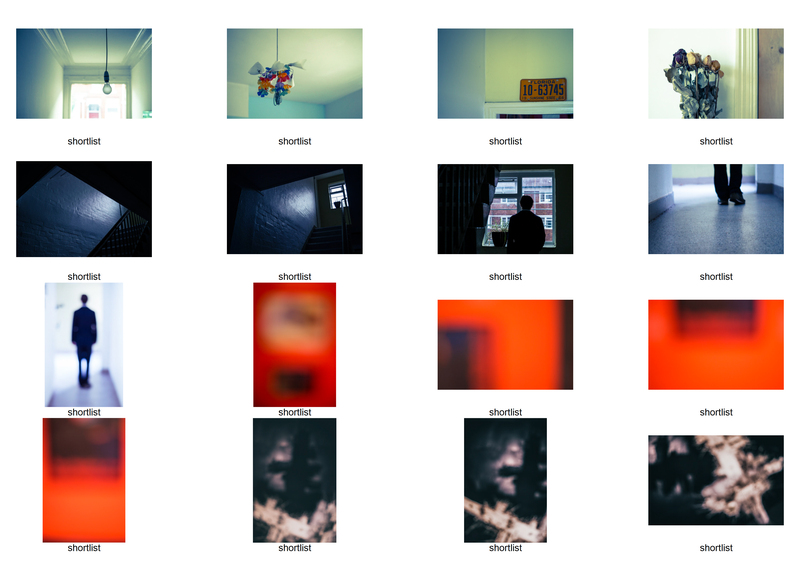 I feel this selection best represents my work and the direction my practice is moving, seeing the final portfolio selection in totality, it feels coherent and appropriate for the audience I intend it for and it feels right as a selection I can stand over. Images – Print and Finish. 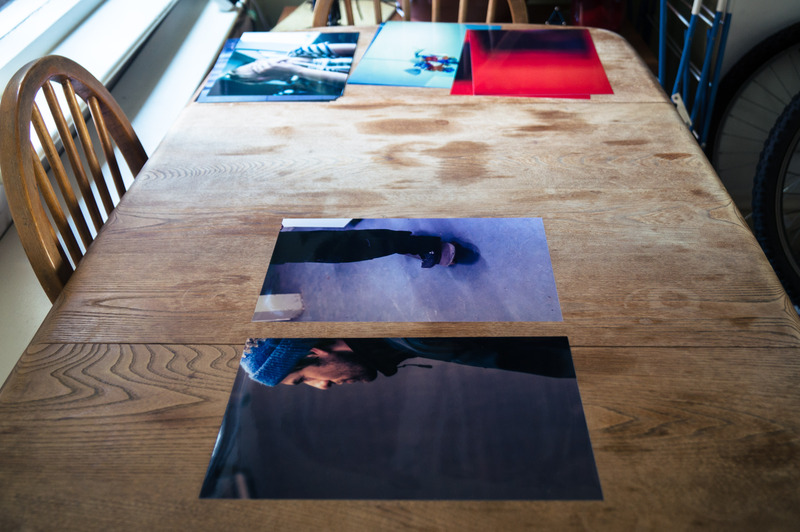 Once I had my final selection of images my thoughts turned to how my images should be printed and the print finish. 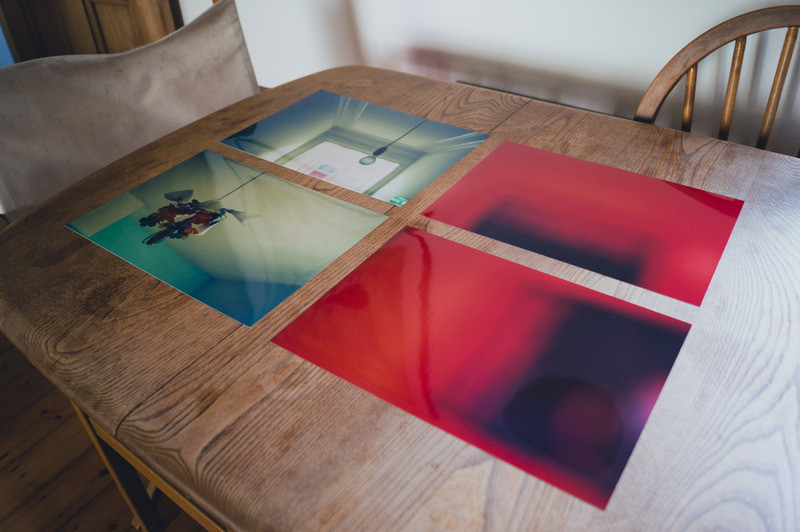 As I had previously used a local professional printers – DS Colour Labs and was impressed both by price, range and quality of the prints, I decided to use them again. Price was going to have a huge impact upon the type of prints I could afford, so making the correct choice was even more important. If money were not an object then one of the fine art prints options would have been my first choice, something like the Fine Art Smooth Silk 300 – “a high quality acid free fine art smooth paper of 300gsm, coated with a unique new inkjet receiving layer that gives a semi-gloss finish to the printed image.” it was important that the prints I chose helped make my images make the right impact, I needed the images to ‘pop’. As it happened I had ordered the glossy standard prints, this finish was “Ideal for images that require an extra punch, especially when used in exhibition work or for presentation. All Glossy prints are printed on Fuji Crystal Archive Paper.” My choice for this type of finish was also based around my choices to have a coherent approach with both my printed portfolio and my business card/postcards. As my cards already had a high gloss finish it seemed right that my printed images also did too. 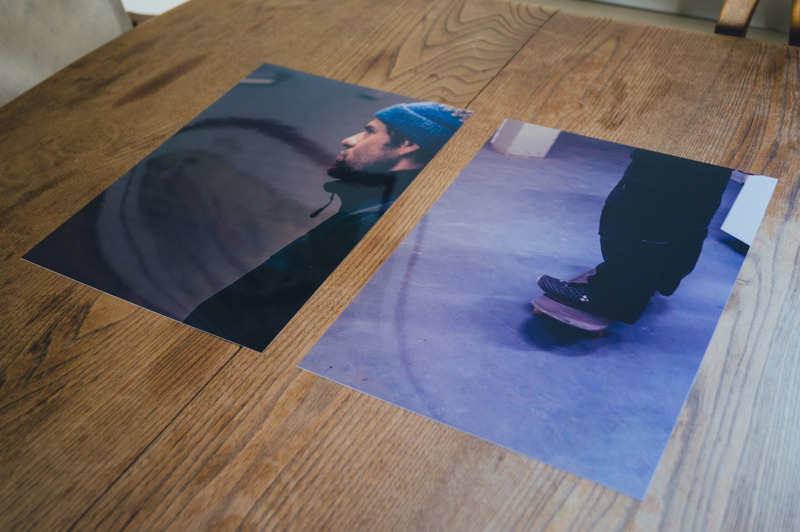 Printed images – Glossy A4 on Fuiji Crystal Archive paper. 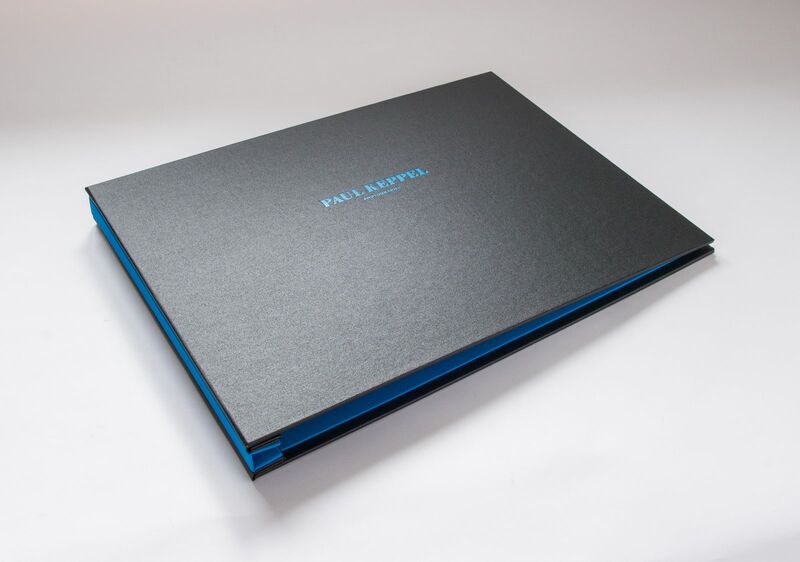 The final aspect of putting the portfolio together was deciding on the means of presentation, this meant either a presentation folder or a presentation box. 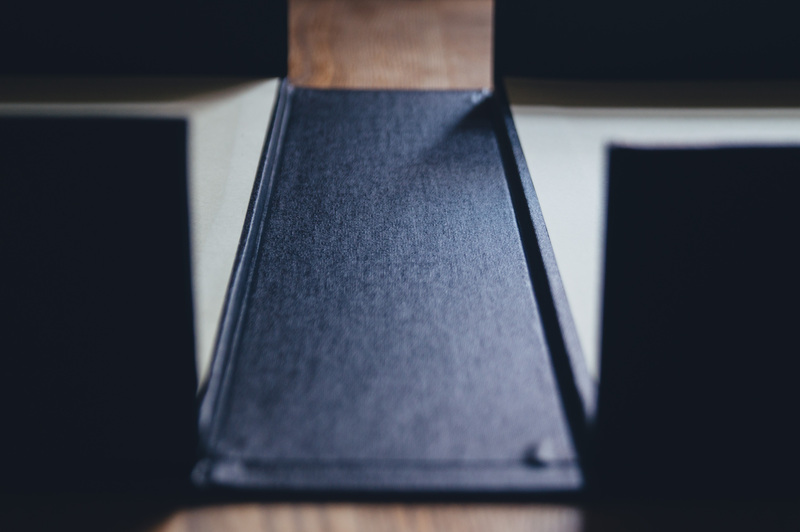 At first I was eager to check out presentation folders, I’d seen some artist friends who had some beautiful folders and was keen to perhaps pursue this option. However, upon investigation, I soon found out that presentation folders, at least the good ones, ones you’d be proud to present your work in were expensive to say the least – prohibitively so in some cases. At the other end of the scale there were some very cheap looking alternatives, ones which if used would do my work a disservice, there seemed to be very little in between these two options in terms of affordability or quality. 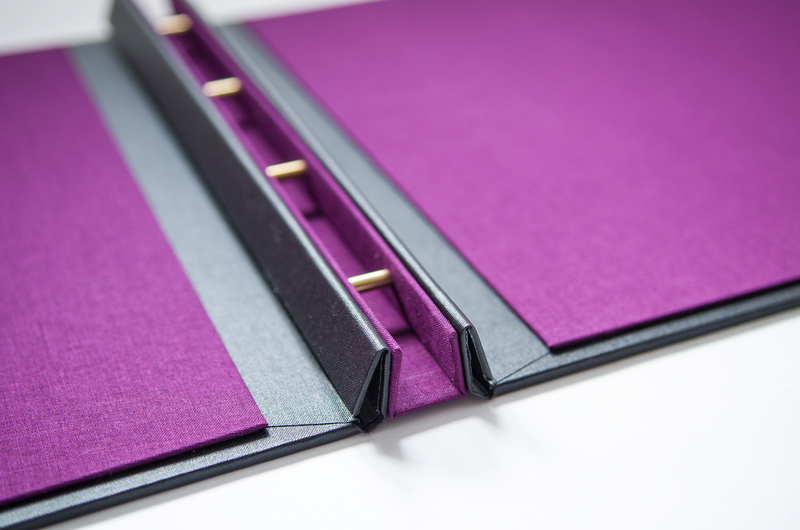 Custom hand-made portfolio folder by Hartnack & Company (http://www.hartnackandco.com/product/fabric-covered-hidden-screw-post-portfolio-binder) Had a base price of around £85 but prices grew as more customisations were added. The overall finish however was top-notch and had price not been a massive factor in my choices, I’d have likely seriously considered a folder. Custom hand-made portfolio folder by Harnack & Company (http://www.hartnackandco.com/product/fabric-covered-hidden-screw-post-portfolio-binder) Feature screw-post settings for the image pockets to be attached. The other option was a presentation folder, something I had barely considered prior to a tutorial where the flexibility of such was discussed – I had not really considered why a presentation box would offer greater flexibility for my work to be viewed during a portfolio review or interview. 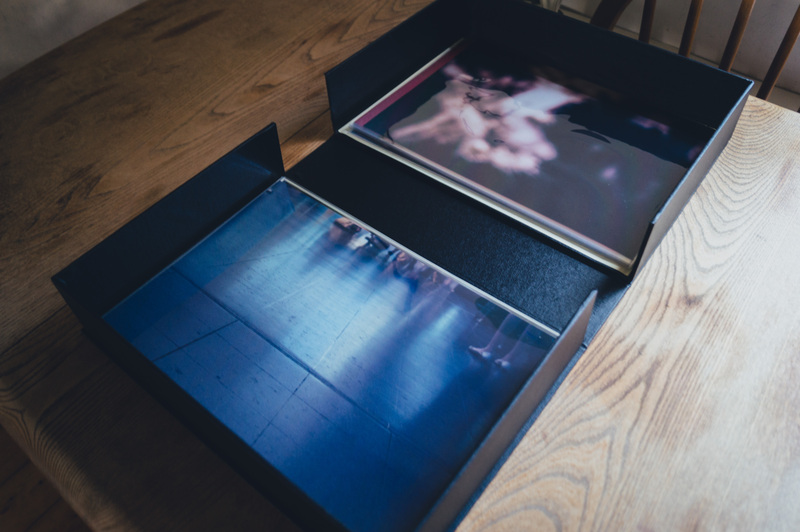 For starters, the box makes the images far more portable in terms of being able to handle the images and pass them around or to lay them out on a table. It also makes the images far more interchangeable should I need different images for different situations. 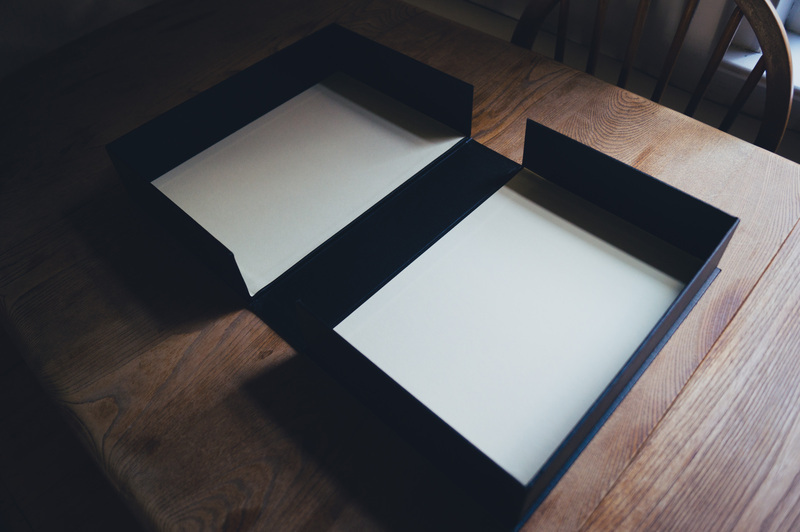 Finally, the cost was a lot lower and as I also found out presentation boxes were now seen as the best way of showing your work at galleries and such. I decided that this option was best for my portfolio and began a search for a good quality box, again there were quite a few options on-line and in store, but most weren’t of the quality I was looking for or were very expensive for what was being offered. 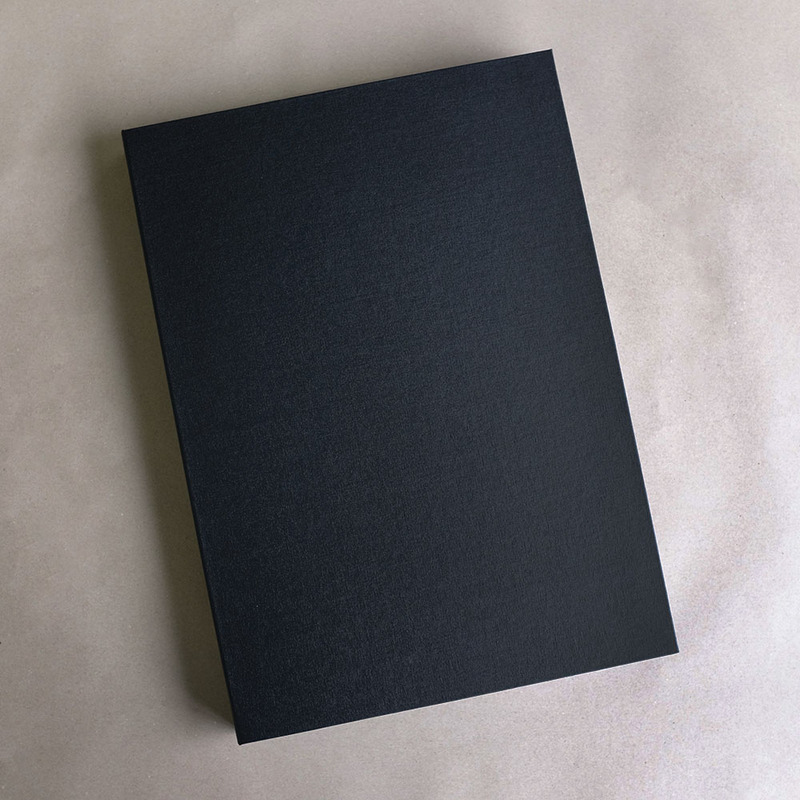 Eventually I was recommended Silverprint.co.uk and ordered a beautiful A4 Portfolio Box, 6.5cm depth with buckram cloth cover and cream internal. 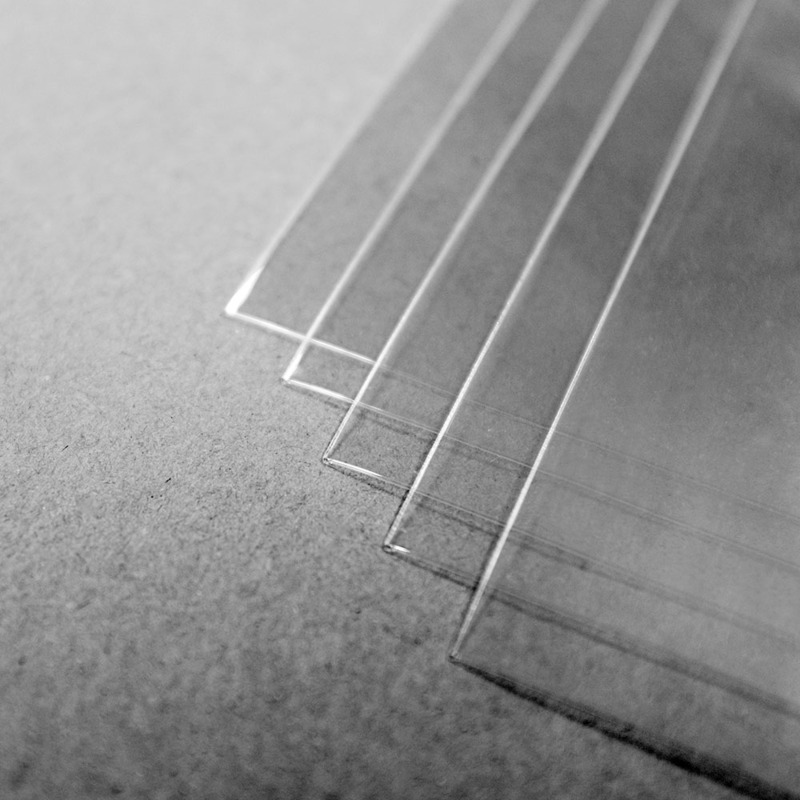 To ensure my prints were protected but also looked great I ordered crystal polyester sleeves – These were also by far the cheapest option for presentation. Silverprint Portfolio Box A4 6.5cm Depth Cream Internal (http://shop.silverprint.co.uk/SP-Portfolio-Box-A4-6-5cm-Depth-Cream-Internal/product/SAB002103D/SAB002103D/) Provided the prefect option for my portfolio. Getting to this point has taken sometime, but careful consideration and not rushing things has helped ensured that my choices were well thought out and appropriate, with the result being a portfolio that meets the brief’s requirements and more importantly my own as a fine-art practitioner. I am now the happy owner of a portfolio that not only looks great and does my work justice but one I can stand over and feel confident to show my audience. The clamshell design allows for images to make full use of both sides when open – images can be viewed and placed in succession from one side to another or easily removed to be passed around or displayed on a larger surface. The sturdy box with buckram cloth cover and cream internal makes a good impression and lets the work shine. 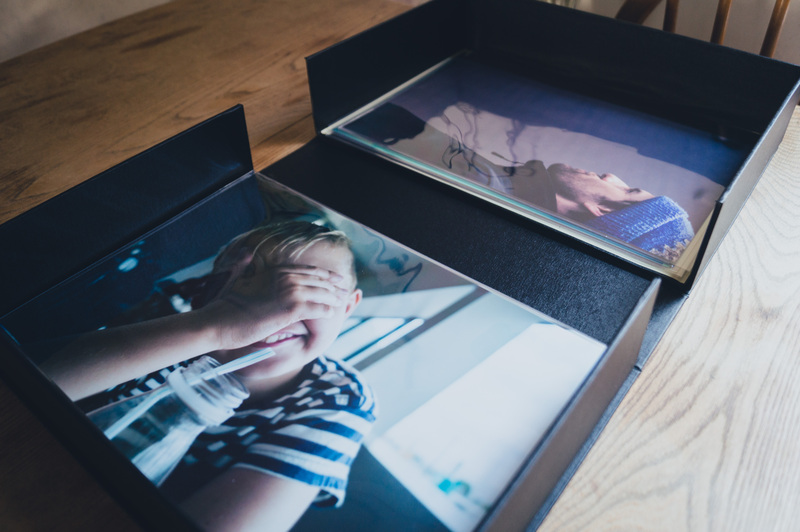 Printed images in situ – both box and images look great. The crystal polyester sleeves are barely visible. if i have any reservation about the sleeves it’s that they can be quite reflective at certain angles obscuring the image. However, this is a minor nit-pick. Another key element for the professional Frameworks III module, was to provide either a CV or a bio for submission, in order to compliment the website and on-line/offline portfolios also being submitted as core elements. A CV (Curriculum Vitae) was something I had provided for last years module but always felt that it need honing and polishing further, in addition to adding new information since it was last updated. As the changes to my CV would require only a minimum amount of work I decided that conceiving a bio was something i would want to do in addition to providing an updated CV – Besides as my website was all but crying for a bio section it seemed the right thing to do. Education or training in the field of art/photography. Related experience in the field of photography. A summary of my artistic philosophy. Artistic insights or techniques that are employed in my practice. Keep the bio structure short, concise and to the point. Write the bio in the third person. With this formula I came up with a relatively short (158 word) bio that I believe sets the tone for my practice and elucidate a little on who I am and what my work is about. 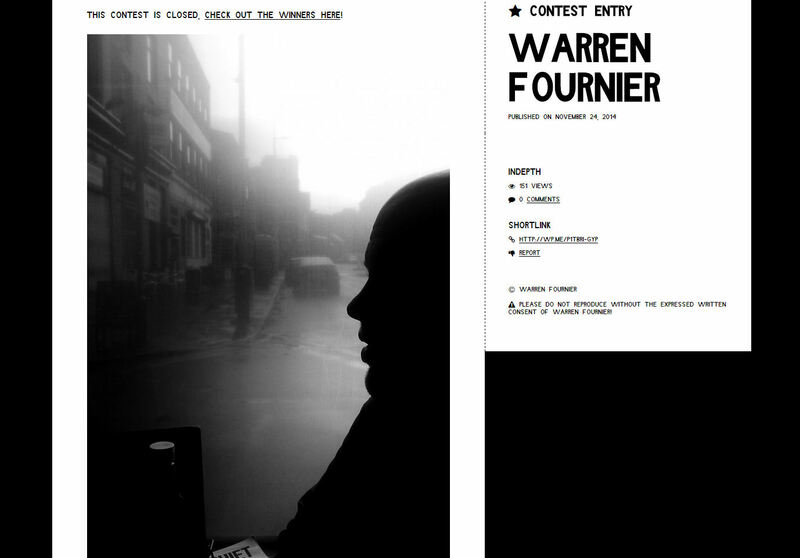 Warren Fournier is a Manchester-based photographer. 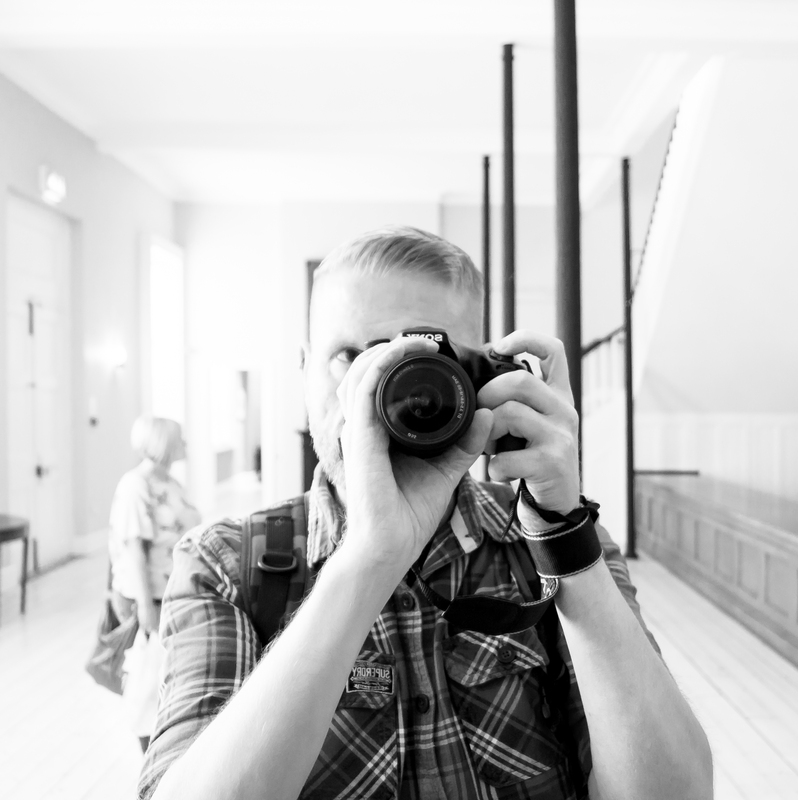 For the past three years, he has been working towards finding his photographic voice. 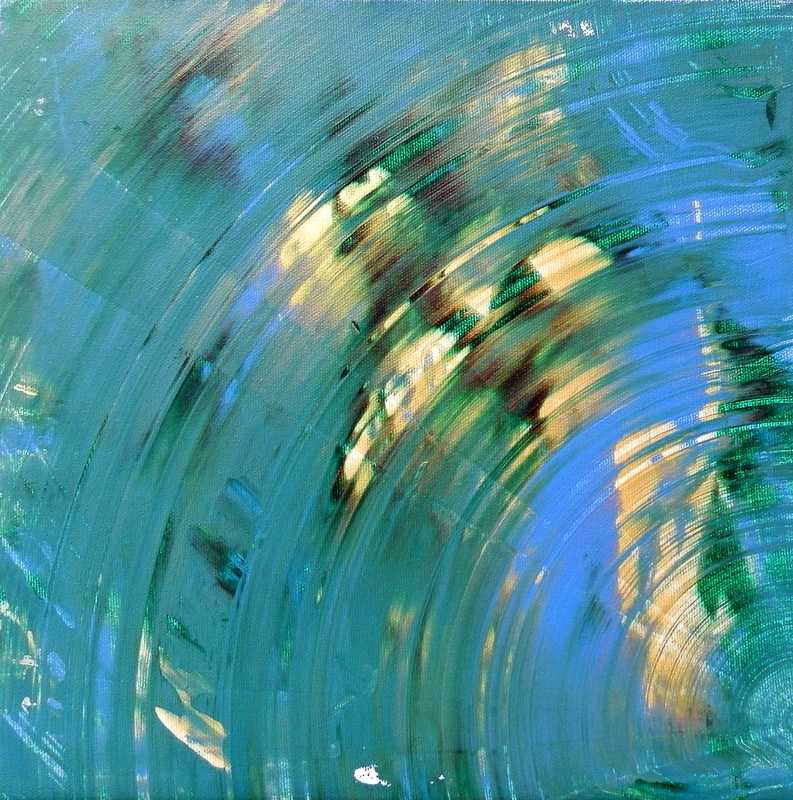 His work is reflective and reflexive in nature, and it explores intimate relationships, memories, and experiences. A natural introvert, he is interested in the way the camera allows him to emotionally detach to get closer to his subject and fully explore its possibilities–something he would not otherwise be able to do. Fascinated by the natural qualities of light, of cropped frames, and visual thresholds, he is increasingly exploring the bounds of visual perception and the conventional photographic subject; he continues to explore these elements alongside his pursuit of self-understanding and truth. 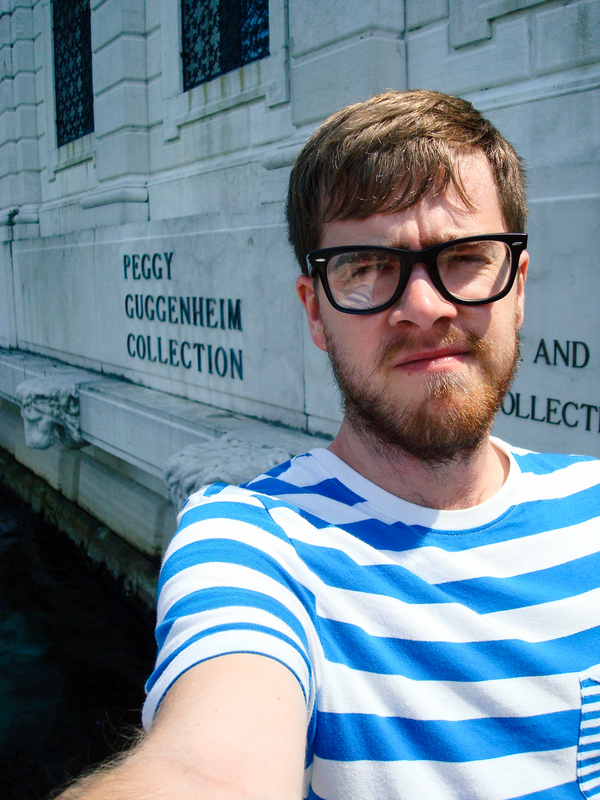 In the past, he has worked for Castlefield Gallery, Manchester & Salford Create, MediaCityUK in Salford, providing documentary work for various exhibitions and shows. 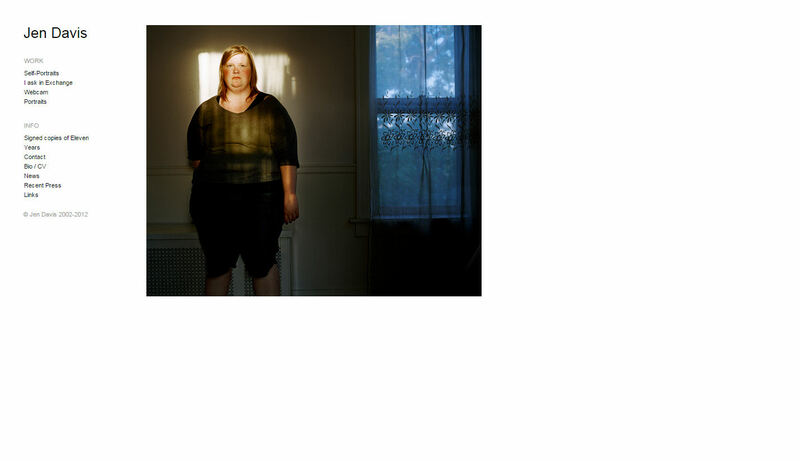 He is currently in the final year of the BA (hons) Photography program at the University of Salford, UK. In addition to the bio I decided to add a tag-line which summed up my artistic philosophy in a short succinct quote – ““Truth via reflex, understanding through reflection.” This tag-line also features on my business cards and my website. The above document was the CV I’d created as part of last years module, it contained a blend of my old career focus – customer focused management and community work and more creative work and experience. 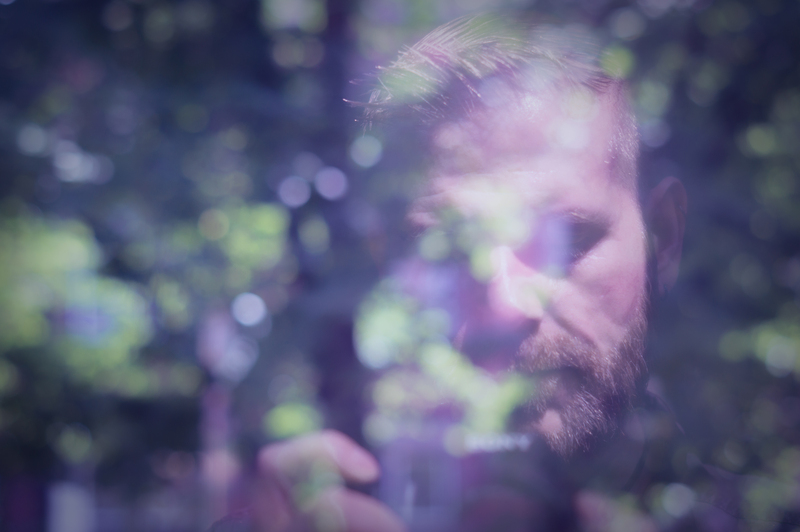 It felt a bit like a half-way house in terms of focus, at the time I felt it was a good document and to be fair it did accurately represent who I was and where I was in terms of work practice and experience. However, when I considered it gain ahead of revamping it it looks like I was in limbo and on the threshold of one life path and another, it resonated quite clearly with a theme I’d used before in a project and more recently for my dissertation, that of liminality – a transitory position that can be applied to a person or place. I was clearly in limbo and on the threshold of moving from one career to another but not longer one or yet fully the other. 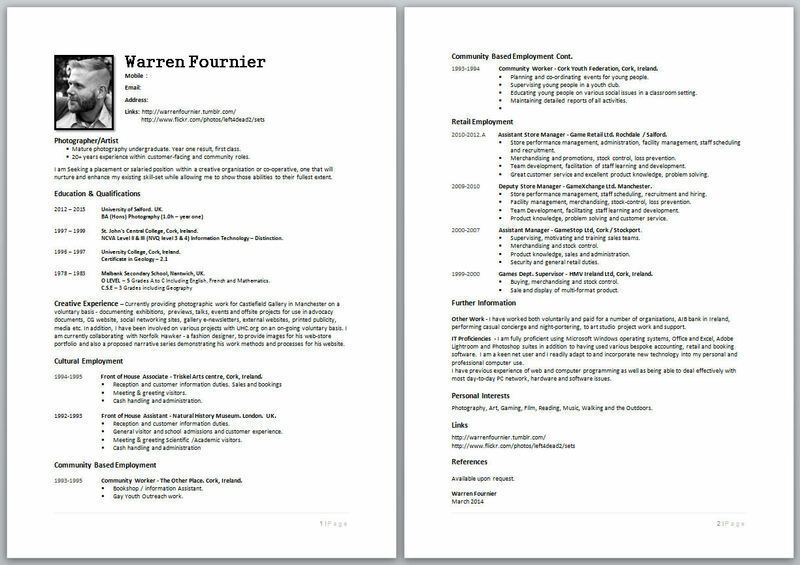 It was clear that my CV needed to accurately reflect who I was now and where my career focus truly lay. That the CV be brief and relevant. I have a long work history and although i need to include it in some form it shouldn’t overwhelm or dominate. The most urgent thing that needed doing was updates to the CV in terms of content – new work experience along with a new exhibition needed including and I needed to remove the list of roles associated with my former career. These elements would be included in an ‘other work’ section and leave the main body available for cultural based work and experience. Another change I wanted to affect was in the fonts i used. On the previous CV I don’t think the fonts I’d chosen were entirely appropriate and had a detrimental effect on the look and feel of the CV. This time I chose fonts that I thought were easy to read while still making a pleasing visual impact – Century Gothic for the headings and Calibri for the main text. Finally after much consideration I decided to change the profile section which I had always used in my CV’s and replace it with slightly rejigged version of my bio. I felt this was a good move as it not only introduced myself and my approach but pulled the Cv together in my eyes. After testing the rejigged CV with a few friends and a fellow artist, they agreed. 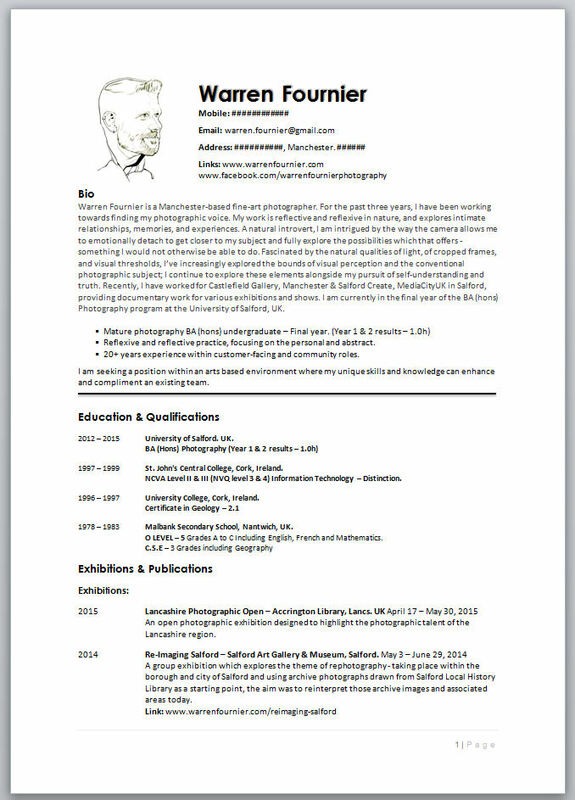 So here is the final redesigned CV. Revamped Page 1 – features a rejigged bio suitable for a CV along with changes to fonts and greater clarity given towards pertinent information. 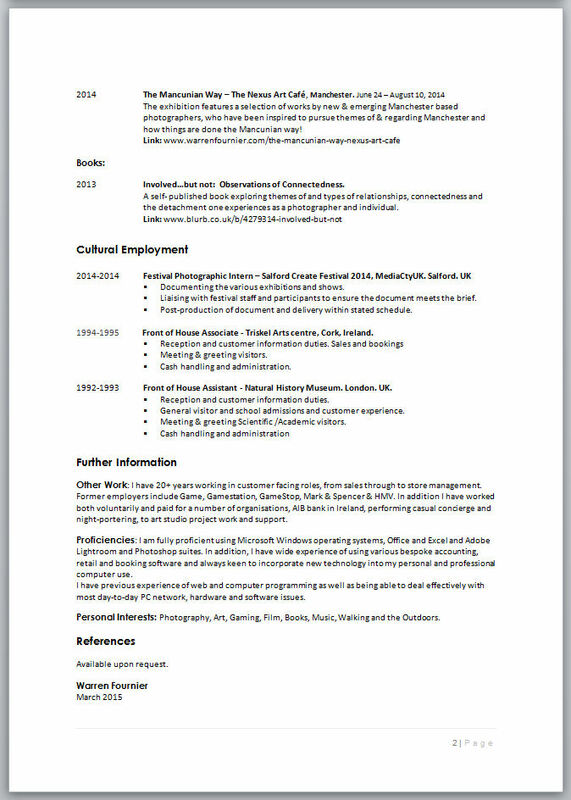 Page 2 of the revamped CV – features a focus on cultural employment with my former career employment mentioned within the other work section,. One the things I’ve been trying to do over the past few months is to consider how to move my practice forward once I complete the BA degree. Study and academia has been my life for the past three years and although learning is an ongoing process, this particular chapter in that process comes to an end in a matter of months – with this in mind I need to ensure that I don’t suddenly come to a halt once I graduate, although truth be told a nice long holiday would be most welcome! One of the areas I am keen to explore to ensure that I don’t just stand still, is by engaging in artistic collaborations – whereby I can not only find encouragement and support in moving my practice forward, but also learn new skills, forge new and lasting working partnerships and of course make new and varied works. My first experience of such a collaboration came about with two of my cohorts Cherry Harrison and Tobias Christian during the second year of the BA during the International Markets & Contexts module, where we conceived a framework for an international photography festival as well as a short body of work which complimented the festivals theme. The overall experience was very rewarding with ideas and work being shaped by our individual input as well as working as part a group – the support we each gave and received was something I’ve been keen to pursue since. However, it’s not been an easy task seeking out suitable or appropriate collaborations, especially as I am quite introverted and shy – networking and such activities are not something I find easy and definitely not something I can force, it’s not conducive to the natural evolution of any new friendship or prospective working collaboration. Instead I’ve taken a path that suits my approach, that of fostering new personal friendships with people I feel I have something in common with (both personally and professionally) and exploring the possibility of collaborating from there. The first of these tentative steps towards a path that involves collaborative work at its core, came about through a friendship I made when I was introduced to a Canadian painter and multi-media artist Fraser Radford. We’ve quickly established a friendship despite the fact we live on opposite sides of the Atlantic Ocean and one of the things that has come out of this friendship is a mutual admiration of each others work and a desire to work together on a project when time and funds permit. The means of working together have yet to be discussed, as is the nature of the project partly due to my own commitments with finishing my studies and Fraser’s own commitments too. Although we have no firm details on what this project will entail or to how it will be communicated, It would however be fair to say that it will play to both our individual strengths as practitioners and involve new approaches for both of us, certainly nothing is being ruled out at this stage – additionally, whether we decide to work either here in the UK or in Canada or try a remote working set-up is yet to be determined. Funding will play a large part in deciding the scope and means of the collaboration, as such we’re both currently looking at options in that regard. The Artists’ International Development Fund – a programme that offers early stage development opportunities for individual artists based in England to spend time building links with creators and cultural organisations in another country, and is definitely something I’m looking at and Fraser in investigating funding options re international projects over there as well. Thank you for taking some time to answer some of my questions. Specifically I’d like to gain an insight to your path to becoming an artist and your work. I’m somewhat late to this creative journey myself and I’m still finding my voice but I’m fascinated to hear from an artist who has clearly found his. Warren: Could I begin by asking you briefly about yourself, your background and your journey to becoming a working artist. Warren: Tell me a little about your practice – inspiration, ways of working etc. and your work. Fraser: My practice has changed a lot over time but my current focus, with my painting anyway, is to work without brushes and use unconventional tools like rulers, mops, knives, sticks, drywall scrapers, as well as my body. I enjoy getting up close and personal with the work. I will usually take a piece of canvas, lay it on the floor, wreak havoc, let it dry then stretch it after I am satisfied with the result. 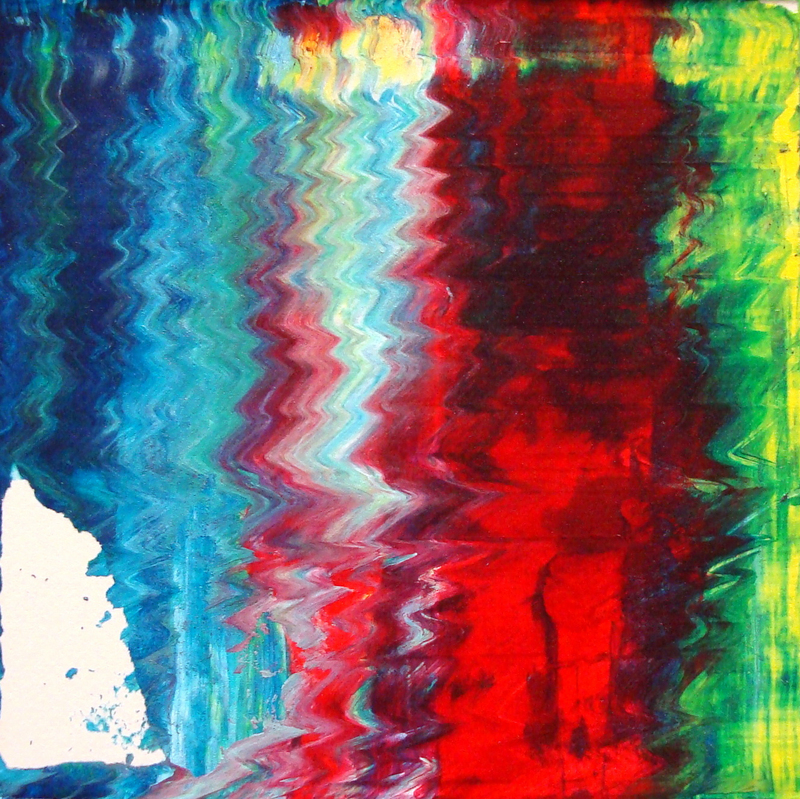 Gerhard Richter has been a huge inspiration for me, along with Jean-Paul Riopelle, Helen Frankenthaler, Friedel Dzubas, Joseph Drapell, as well as a few artists involved with the Japanese avant-garde group Gutai, mainly Shozo Shimamoto and Kazuo Shiraga. 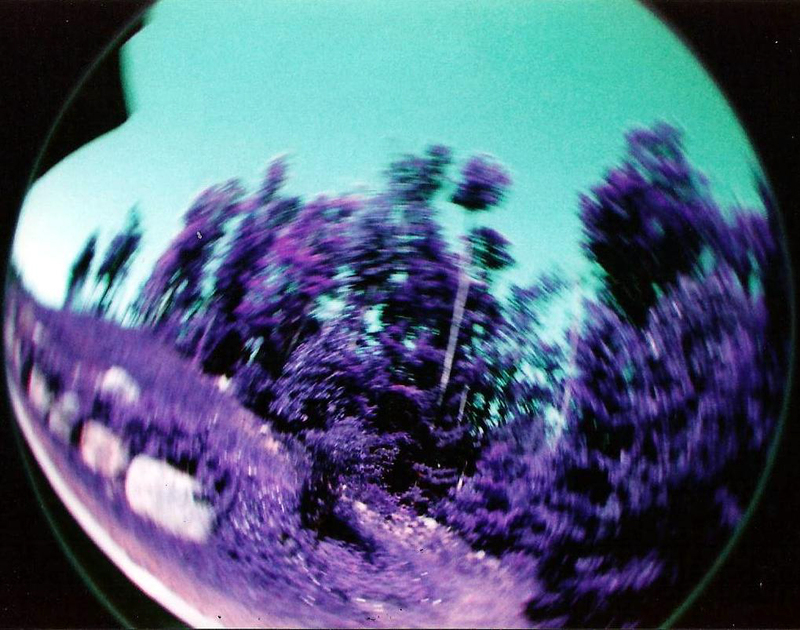 Warren: Your work spans multiple disciplines – paint, film, photography, sculpture etc., but do you prefer one over another? Fraser: To be honest, I don’t think I really have a preference. They are all super fun to work in. I mean, I have more ideas in my head about potential paintings but I am really wanting to try my hand at experimental film. Warren: As an accomplished artist what would you say are the biggest problems with getting a project off the ground and how have you overcome this? Fraser: I would say that my biggest problems would be finding space to work, as I work mostly flat on the ground, as well as having the money to purchase materials. For space, I am usually restricted to the floor in my bedroom so my canvases are not as large as I’d like them to be but they still look good. When I was in Haliburton, I was able to commandeer a shed to work on one of my largest canvases yet. Unfortunately, I still need to finish it, hah. Warren: Now that you’ve a few exhibitions and publications under your belt what would you say are the biggest hurdles in getting your work recognised and out there? Furthermore, can you offer any advice on how you overcome these? Fraser: The biggest hurdle is trying to get your name out there. There are so many artists applying to be in the same galleries, group shows, etc, as you, that work has to be top-notch. You cannot expect a gallery to come to you asking to show your work or a collector wanting to purchase some work of yours. You have to break out of your shell and pursue galleries which have a roster of artists that relate to your own portfolio. You should also search the internet for calls for submissions but BEWARE; there are A LOT of scams out there. Do your research! You should also attend exhibition openings so you can introduce yourself to people, as well as the gallery owner. Make small talk, have some food and wine. Make sure you have business cards with you. 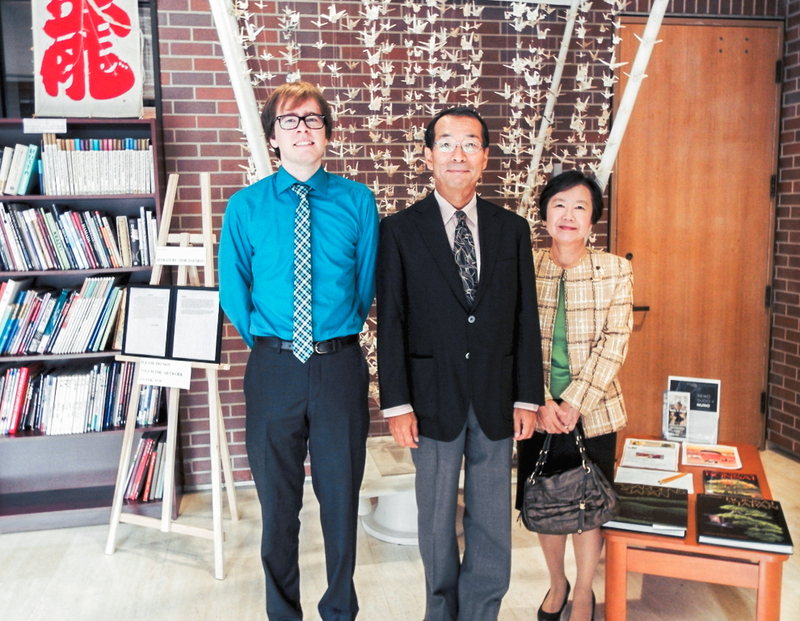 Fraser and the Japanese embassador at the Japanese Embassy in Ottawa. Senbazuru (for Sadako), 2014, 48 x 72 x 90 inches, mixed media installation was exhibited at the embassy as part of a solo exhibition. Warren: As an artist if you are bidding for a commission, what are the expectations of the commissioners and how do you meet those expectations? Fraser: Commissions can be tricky because a lot of the time, clients expect you to work on these grand works…for free or next to nothing. They don’t realise that an artist has bills to pay, food to put on his or her own table, trying to make a living for themselves, etc. I’ve had to turn down multiple offers for those reasons above. The few commissions I have done however, the client and myself worked together to figure out the budget, what I could create within that budget, as well as added shipping and postage onto the budget. I keep in touch with the client about updates I’ve made with the piece and send them photos of the progress. Once the piece is finished and the client is satisfied, we work out shipping/delivery and it is a done deal! 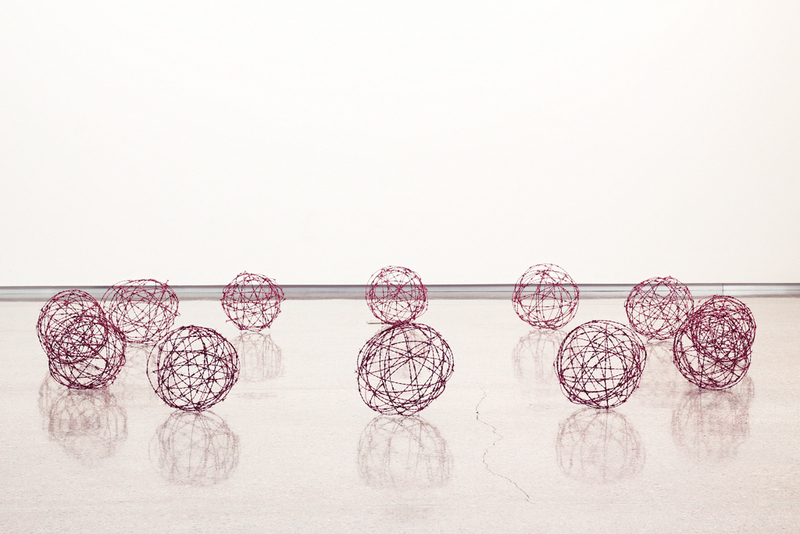 Warren: When thinking about your work, what is your preferred way to have it exhibited and how do you go about this? Have there been times where you’ve sacrificed your vision just to get it out there? Fraser: It depends on which work I am showing. With my sculptural work, I prefer there to be plenty of space around the piece so viewers can walk around and inspect the work up close. Warren: Creating a body of work from idea to creation is very gratifying and rewarding personally, but it can also be costly to fund. How have you navigated this issue in the past and now that you are an established artist. Has it got easier, if so, how? Fraser: I’m always on the look out for sales at art supply stores, as well as purchase materials from the local hardware shop. It definitely has not become easy…yet. I am looking at applying for government grants through the Canada Council for the Arts, as well as the Ontario Arts Council so I can get numerous pieces framed, as well as purchase materials for upcoming projects I have in my head. Warren: What would you say is your favourite project and why? Fraser: I think one of my favourite pieces so far is a mixed media piece titled Light Bulb Crash (for Shozo) (pictured below). 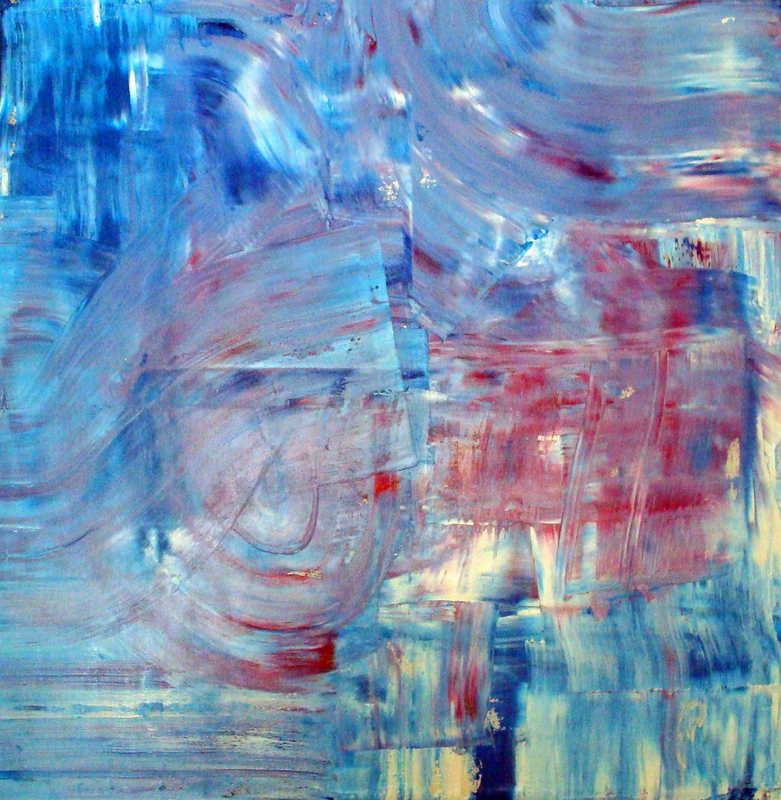 It is a 48 inch tall by 72 inch wide canvas and combines materials like oil paint, turpentine, raw linseed oil, and sand. It was definitely the most fun (and messy) piece to create. 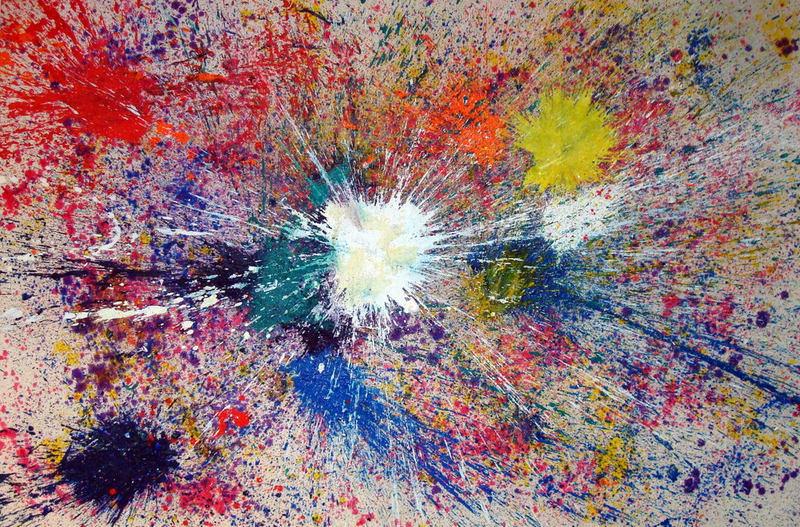 I filled up old light bulbs with the different media then tossed, dropped, and threw at high-speed, at the canvas, resulting in different splatter effects. It was also very satisfying to create something like this, as a memorial piece to Shozo. I hope to be able to show it in Japan one day. Warren: There seems to be a strong element of collaborative work and exhibiting in your portfolio. Is this something you enjoy and what are your expectations for any such collaboration? Fraser: I do love collaborating with people as long as they are willing to put in as much work as I am and not just expect me to do everything, then stamp their name on the work at the end. That does not make me happy. I’d love to be able to have more collaborative or two-person exhibitions with artists. Warren: Galleries and Museums are always looking for artists and practitioners but they are also constantly approached as well. 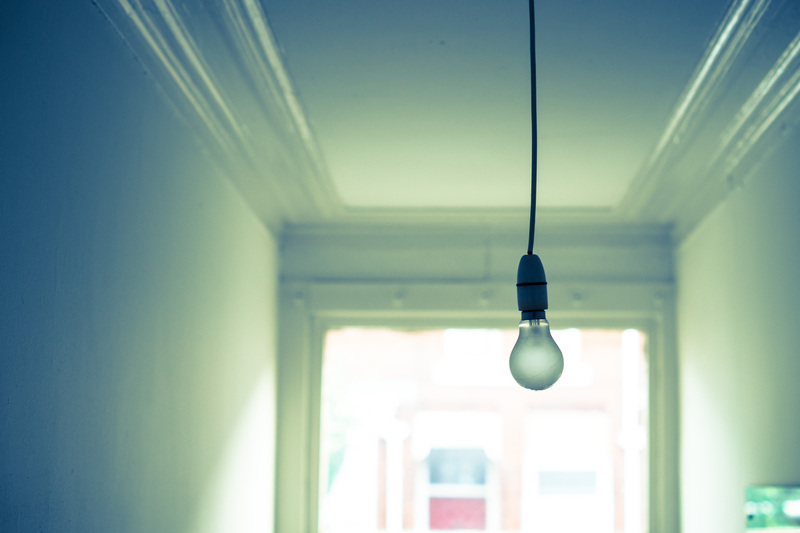 How do you differentiate yourself from ‘the crowd’ and how important is to select the right gallery for your work? Fraser: Like I said earlier, do your research. Start with local galleries and see what their artist roster is like. If their work matches or is similar to your portfolio, send an e-mail to the gallery introducing yourself along with a small sample of your work, CV, artist statement, link to your website. Also ask if you could set up an appointment with them so you can meet and talk about your work. Attend show openings at a gallery you’re interested in showing at (be reasonable, of course…no one can show at the Tate for the first show ever) and introduce yourself to the gallery staff. It has become very unpopular to just walk in with your portfolio. Galleries are not impressed by that anymore. Warren: What’s next for Fraser Radford? 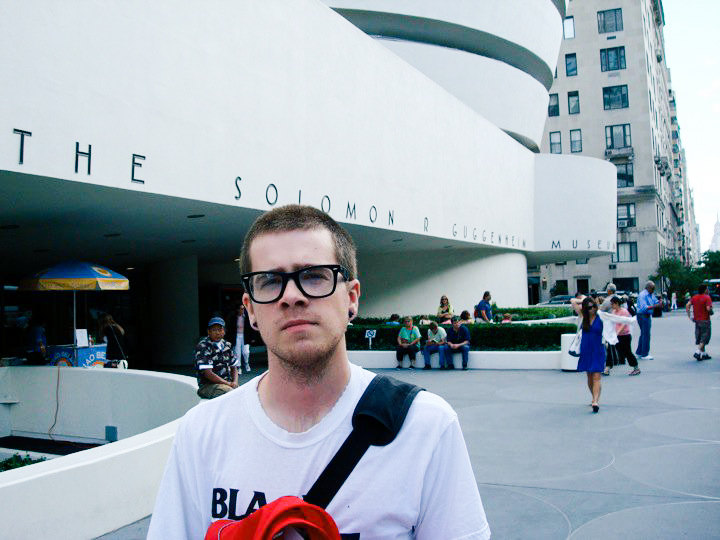 Fraser: I’m going to keep applying for exhibitions, grants, residencies and working on new pieces. I’m also going to be displaying my barbed wire sculpture Ceremony (pictured below) in the Sculpture Garden at Oeno Gallery in Bloomfield, Ontario in May. I have also been asked to give a short talk at the Haliburton School of the Arts in the Spring/Summer. I am very excited about that. I have a few ideas for potential series’ brewing in my head so hopefully I’ll be working on those over the Spring and Summer. Keep your eyes peeled. I’m also hoping to be able to exhibit some works in the U.S. and Europe this year. I also hope to be able to travel a little bit more, for artistic research, of course. 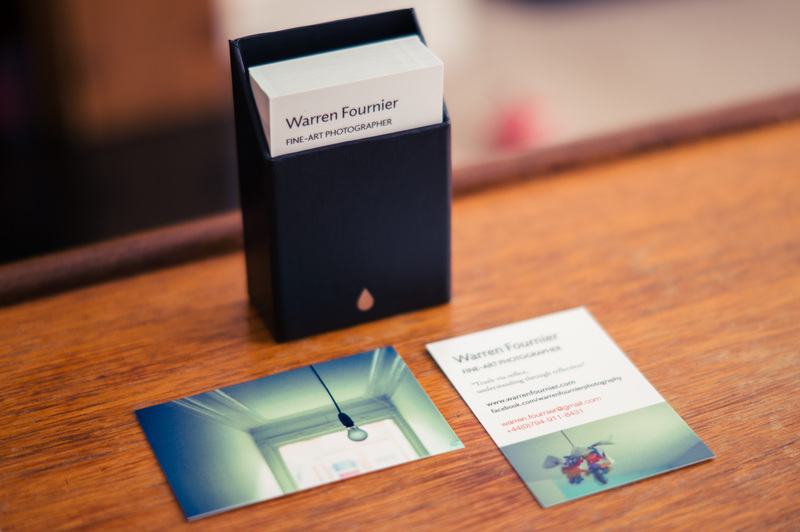 Warren: Finally, any advice for someone not keen on following a commercial photography career but rather an artist who uses photography as his medium? I’m still trying to find my voice artistically and I’m still timid about promoting and putting my work out there. Any advice in this regard in achieving this is most welcome. Fraser: Hmm, I’d refer back to the questions earlier on about approaching galleries. The biggest thing to do is get out of your comfort zone and get familiar with the gallery folk in your community. It really does help. Warren: Finally, I know we haven’t gone into detail about a future collaboration but I have some early ideas and I’m really looking for working with an artist of your caliber and accomplishment. I’m especially excited as this will also be a cross-discipline project and international in nature and I’m hoping to gain a lot from this. How do you view this and is this kind of collaboration something you’ve done before? 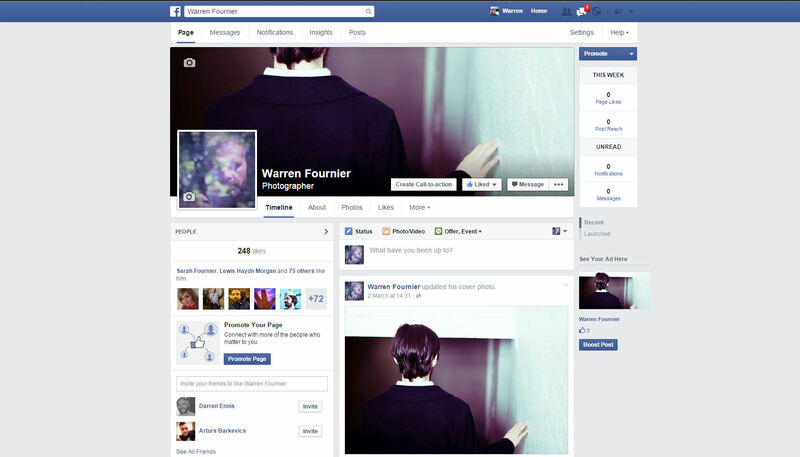 Fraser: I’m very excited to be collaborating with you, Warren. You are a very talented photographer and I think we could make some intriguing work together. I’m excited to hear about your ideas. This will be the first time I have participated in a cross-continental collaboration. I’d also like to thank you for asking me to participate in this interview. It was fun. So the current plan is to start making firm plans once I’ve graduated in July, from there we’ll see how things shape up, but I’m really looking forward of the opportunity of working with such a talented and creative artist as Fraser, roll on July! Social media has always been something that we’ve been told to embrace as much as possible with our work as it opens up new avenues of connections and opportunities to network etc. However, if you’ve read any of my previous blogs on this very subject (Digital Profiles for Creatives) you’ll be aware of my private nature as a person and how social media represents a bit of a quandary for me in this regard. That said I am very aware that I need to promote and push my work in a way that enhances and compliments my personal practice and my work. It is for this reason I have undertaken certain measures in embracing social media for this purpose, it is a somewhat piecemeal approach but I believe it is the right one and will allow me to engage in a way I am comfortable…small steps lead to bigger ones as they say! One of the few Social Media sites I was already engaged with was Facebook so it seemed like a natural place to begin my practice engagement with social connectivity here too. It didn’t take me long to set up a page for my practice and I already had a collection of friends, acquaintances and cohorts to invite to the page and although it’s only been up and running a couple of moths or so I have already acquired around 300 likes including likes from outside my immediate Facebook social circle. The page is fairly simple to administer and I have followed a rule of continuity of look and feel between web and Social media to keep a clear identity between the two online elements – this feels right and looks right. http://www.facebook.com/warrenfournierphotography – My facebook photography page, carries the same look and feel as my web and also my other social media connections. http://www.facebook.com/warrenfournierphotography – promotion (read advertising) seems to play a big part of Practice pages like mine, an element I have yet to try but will at a later stage. There are some extra features that Facebook offers to pages like mine which is advertising, something I have yet to try but will when my budget allows. 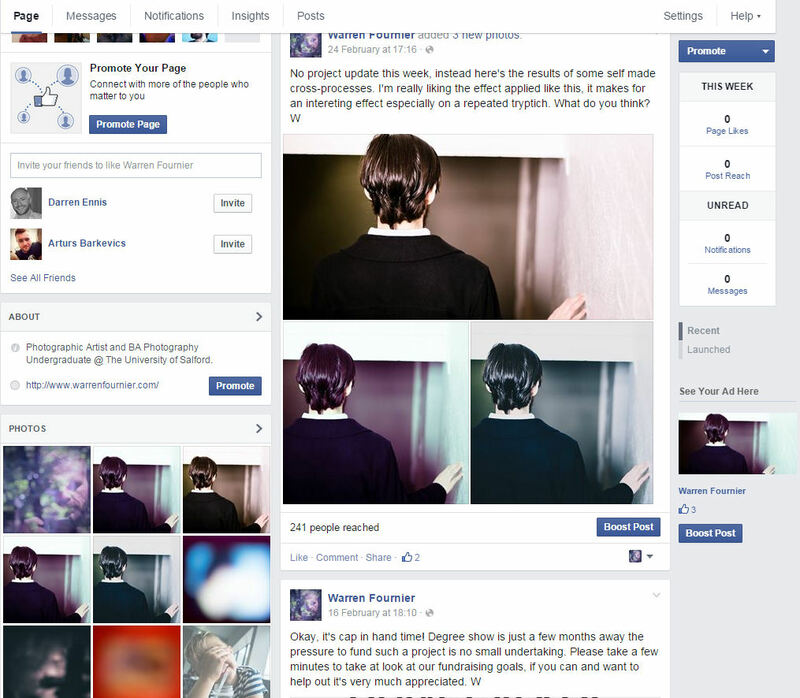 On the whole I am quite pleased with the way this page is developing and th ease of its use. It’s also nice as a tool to let people know what I’m up to atm. 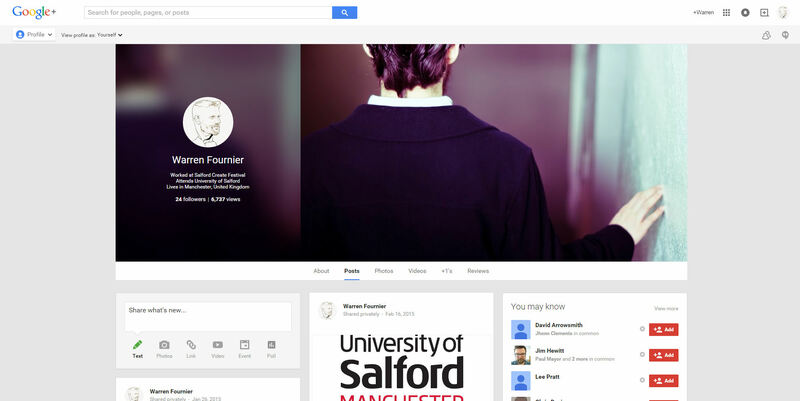 Somewhat ridiculed for its lack of uptake I have found Google+ to have a surprising amount of subscribers and although I don’t engage as much as my other social media connections it is still useful especially as it links to all my other google connections such as YouTube and Gmail etc. 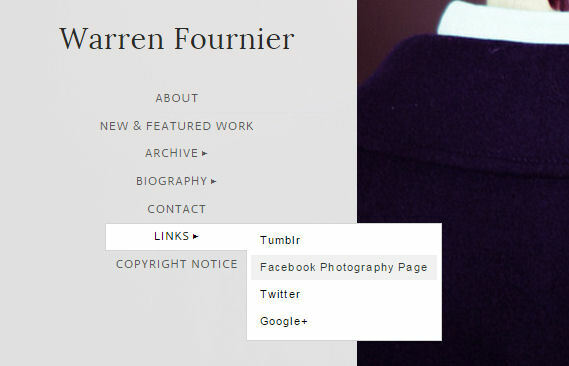 google.com/+warrenfournier – My google + profile, again carries the same visual continuity as my other social media outlets. Twitter is one of those social media networks that seemed the least appealing to me as I’m not someone who spends a lot of time communication this way and Twitter seems one of those sites where it is conducive to posted your every thought and movement. However, as my website and other social connections had direct inks and auto-post options for twitter I thought it might be a good idea to at least try it. As it happens it’s worked out well, if I post something new on my Facebook photography page or on Tumblr I can set it to auto-post a tweet as well, reaching a much wider audience without trying. My approach with Tumblr has been somewhat different in that I have had a Tumblr for some time, purely for access to my interest in geeky/arty/illustration things, as well as popular memes . however while I have not directly brought it under my umbrella of continuity – visually speaking, it is a great place to expose my work this way. I also have direct links to my website and to my Facebook page as well as being able to auto-post to Facebook and twitter with any posts I choose. http://the-darkest-bird.tumblr.com/ – My tumblr and although it doesn visual connect with my other social connections it is still something I use regularly to promote my work and expose my work to similarly minded artist and folk. Behance – still unsure of this atm, will need to look at this in a bit more depth as I don’t want it to conflict with my website. Society 6 – I’ve a few friends who have found some success in having their work on here both as a means of making money but for good exposure too. Creative Hive – I looked at this some time ago and wasnt in the right place in my practice to consider it a possibility. Going forward It could be something I would want to engage with. My initial fears of what social media interaction would mean for my privacy have somewhat been allayed and I can now at least have mwork exposed to a wider audience it wouldn’t have had otherwise. I will still continue to be cautious but hopefully this will prove to be to my credit and the social media I choose to engage with will be appropriate and complimentary to the way I work. The criteria for the website was reasonably loose, however, there were a few provisions that had to be adhered to – the website could be an existing practice website or one designed entirely from scratch, but in either case it must be a site designed with the express purpose of representing both practitioner and work in a way that is complimentary to the practice and area of interest to me and to the audience to which it is attuned. The website must also be designed and constructed by myself either using a template from a suitable online provider or from scratch if I possessed the necessary skills. An aesthetic that reflects that of a fine-art photography practice – an image with painterly and poetic qualities as a front cover. That I could customise existing templates to suit my design needs. A really good first visual impression, something that would get any potential audience to look further. 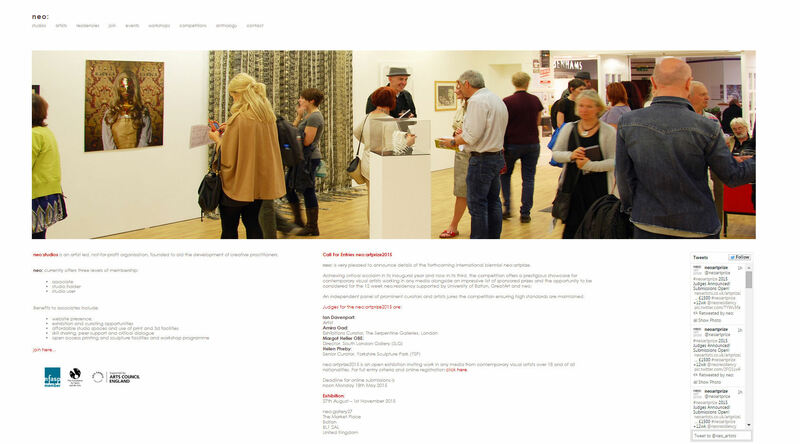 Simple menus – An ‘About’ section, ‘New/Featured’ gallery, ‘Archive’ would lead to older projects and commissioned work and sections for ‘Contact’ and external ‘Links’. The website should have my own domain – I think anything else can look confusing and less permanent. That there were some security features with regard to image downloading, it isn’t always going to be possible to stop someone saving your work once it’s out in the wild but any measures that make it difficult are always welcome. That the website provided Search engine optimisation, webmaster tools and visitor tracking to monitor and ensure my on-line presence engaged as far as possible. 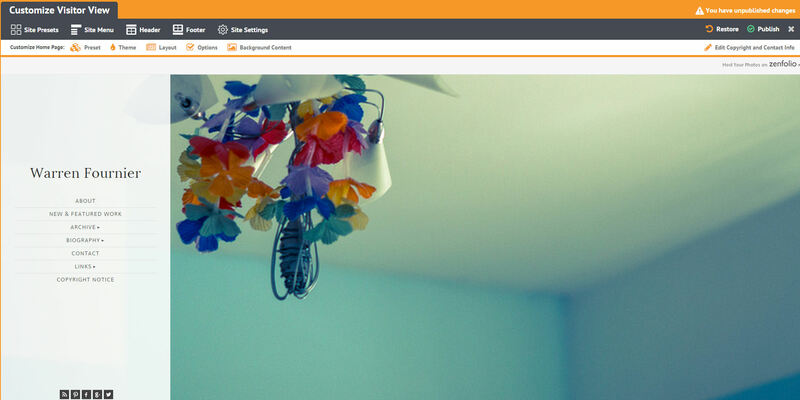 That there were provisions built-in to the viewer interface to share galleries and images with social media such as Facebook, Tumblr, Twitter etc. These were the most important elements to me at this point in time but there was plenty of functions beyond these that I would likely never use, such as custom templates and the ability to design a website from scratch using the in-house tools provided as well as a store to allow your images to be printed and framed. Before I lay out some details on the layout and design choices I made for my final design I should just touch upon the choice for my choice for web hosting – Zenfolio.com. Prior to looking into the possibility of putting together my website I had considered using WordPress.com for my website seeing as all my various blogs were already here, but the price for some of the templates and the yearly subs was a bit steep for my student pocket. I had also taken a cursory look at the likes of Squarespace.com and Cargo Collective. However, the decision was taken away from me when on my last birthday I was gifted with a yearly unlimited subscription with Zenfolio along with my own domain name. 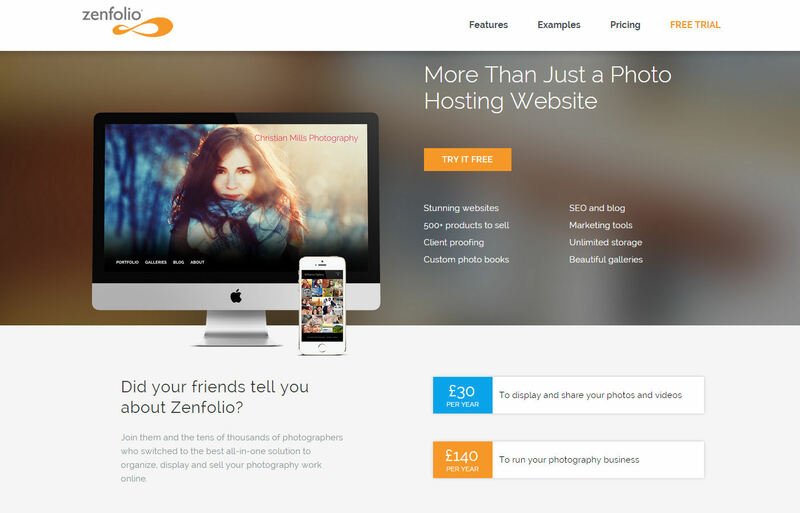 I guess it was the easiest decision I had made and in many regards It saved me considering the minutiae in details and the cost associated with choosing a web host and for that I am glad, and Zenfolio has proved to be a great host so far. It’s quite difficult to show what the first iteration of my website looked like as I didn’t take any screenshots or such, I have however kept to the same template I have used from the beginning altering things like colour and font and layout to my liking. For the most part earlier and the most recent versions looked fairly similar, even using the same front page image seen below. The most recent iteration prior to making final weeks and adjustments to my web front page. The look or feel has changed very little since the first time I started construction, partly due to having a strong sense of the feel I wanted from the site. However, there were some differences in the earlier versions which are no longer apparent – Header menus and a welcome message, which in hindsight were rather distracting and made the front page look cluttered. These elements have long since gone and the above screenshot of the old design looks fairly similar in format to the final and current version. Laid out below are the various elements I’ve put into place to get to my final design and functionality. As I’ve said above, the original front page had too many elements to keep the eye from seeing what I wanted the viewer to see – a clean, straight-forward front page with simple navigation menus and where the main image was king in drawing your attention. To ensure that I had that with my design I removed all unnecessary menus from the top and bottom of the design, ensuring that only the left-hand part of the screen was available for navigation menus. This left the majority of the screen free for my main image, something I was very keen to have as the stand out feature of the front page. I’d decided earlier against a slide show of images on the front page as I felt it could limit the chances of anyone venturing further than the front page. I’d visited cohorts websites who has a slide show or scrolling image feature and it made me less likely to venture deeper into their website to see their other work. I’d also looked at a few practitioners websites whose work I admired and whose practice was in an area I was very interested in placing myself What was interesting was the similarity to their website style although their work was quite different – a clean simple interface with a lead image intended to grab the attention. 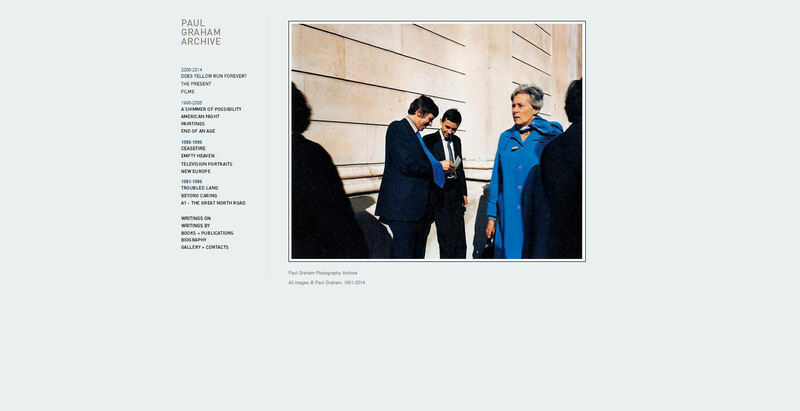 Paul Graham Archive ( http://www.paulgrahamarchive.com/) – Front page design featuring a solo lead image with navigation menu to the left side. Pretty minimal feel almost too minima, but the important thing is it feels like images and body of work are the whole point of this website. Jen Davis website (http://www.jendavisphoto.com/) – has a clean minimal look with a single focus image and again simple navigation menus to the left. Both of these fine-art practitioner’s websites had the elements I also wanted for my front-end design and both had a look that enticed me to look further rather than be content with multiple offerings up front. There was main difference with the aim of my design, I didn’t want it to feel quite so minimal, there was a lot of empty space in their designs, not necessarily a bad thing but personally I wanted the sense of empty space to come from my lead image rather than the design. 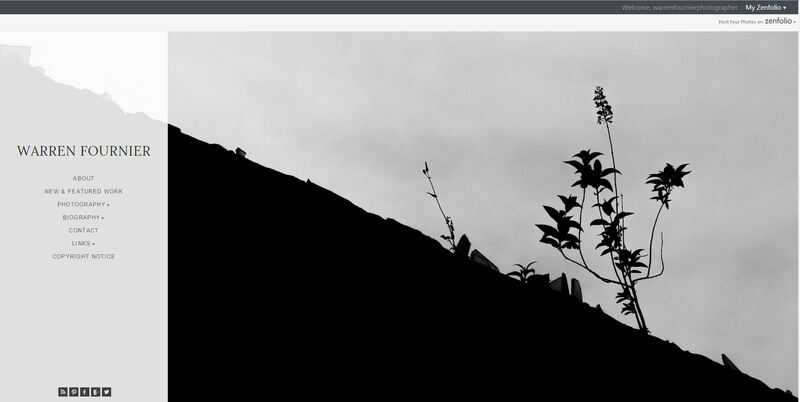 The first image seen in preview for the front page – Taken from a project that was personally quite close to me, it was great seeing the image on-screen like this. If I have any reluctance with this image is that it feels as all the content is crammed into the left side of the screen. My second selection was from the same series as the first image and a personal favourite of the images I’ve taken recently. Again it’s very personal and seeing it used like this actually makes the image feel different, not necessarily a bad thing. 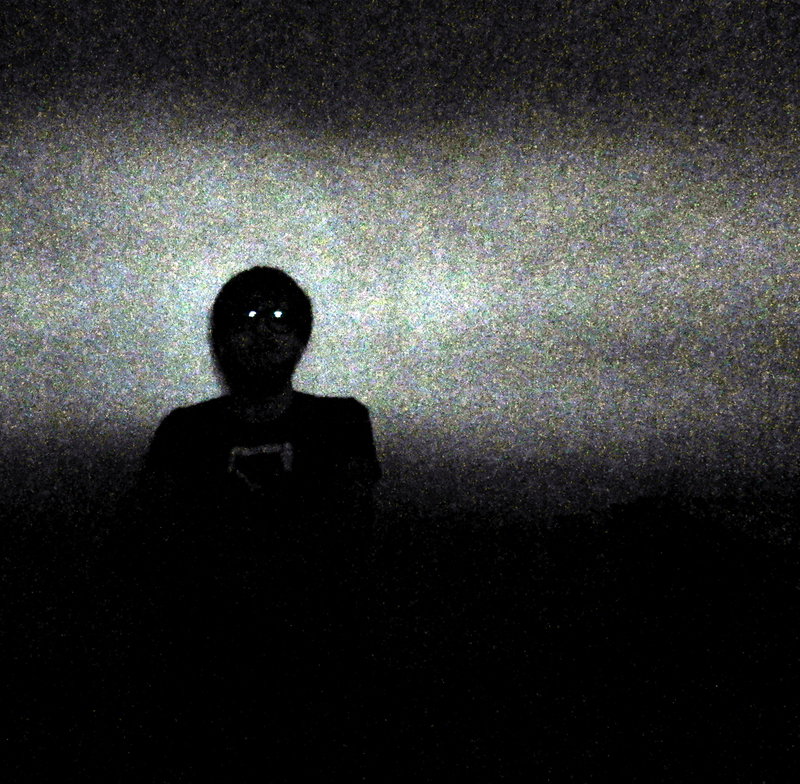 As main image, I like it a lot although It lacks a certain impact I was looking for. The Third image was didn’t resolve itself as I would have liked, it was missing an important aspect of the image which was cropped from the top of the image and while the sense of space it evoked along with proportion was great, it didn’t have the impact I was looking for. The next element I need to get right was the navigation menus, which I feel I’d gotten right first time. About – This link leads to my bio page with an image and bio that briefly describes me and my practice. 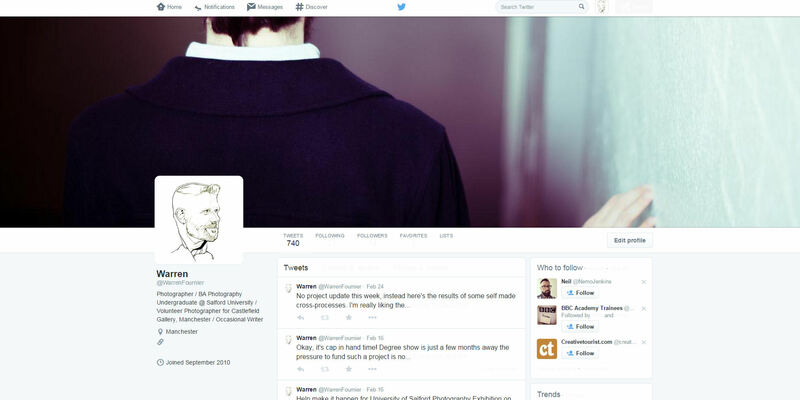 ‘About’ page – featuring my bio and image. I felt that this format worked best for my practice and gave just the right amount of information. It also included my tagline which was also included on my business card which added a continuity with the printed marketing. New & Featured Work – This link leads to a gallery of my latest work and featured archive work so that my audience can ‘quick dip’ to see what I’ve been up to or to get an idea of what my work is about. 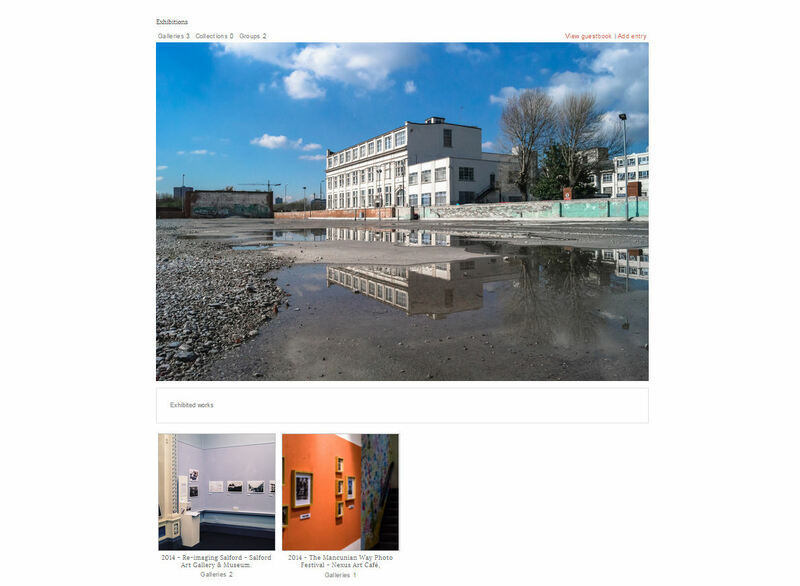 New & Featured Gallery – Features exactly that new works and selected images from archive projects. The gallery has a slide-show of all images in the gallery for ease of viewing but also a thumbnail of each image below for browsing. Clicking on an image will take you to its origin gallery. 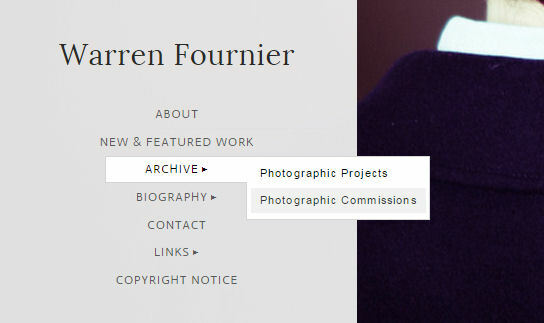 Archive – This link offers a drop-down menu for either Photographic Projects or Photographic Commissions for simple easy access to those works. Drop-down menus allow the main navigation menu to remain minimal while giving access to wider content. Project Work – Similar layout to all other galleries, so as there is visual continuity and to ensure the visitor experience is the same across all pages. The main difference here is on group sections like this, there is no slide show rather a selected image from one of the sub-galleries. Leading from any image within a gallery is the photo page where large versions of images are viewable in detail along with any pertinent information relating to it. 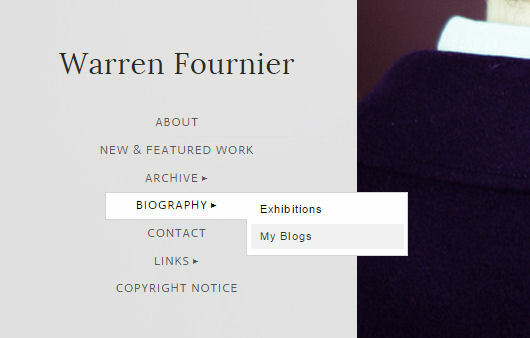 Biography – This Menu again features a drop-down menu leading to section for my exhibitions and my blogs. Biography menu with drop-down items for Exhibitions and My blogs. The exhibition section leads to similarly laid out galleries to those in the Archive sections, whereas the My Blogs lead to my blogs on WordPress.com – these open in a new window so as not to lead the viewer completely away from my website. Exhibitions, again follows the group layout and the individual gallery layout of those previously outlined. Links – As the title suggests these are links to my social media connections, each link opens in a new window to not lead the viewer away from my website entirely. 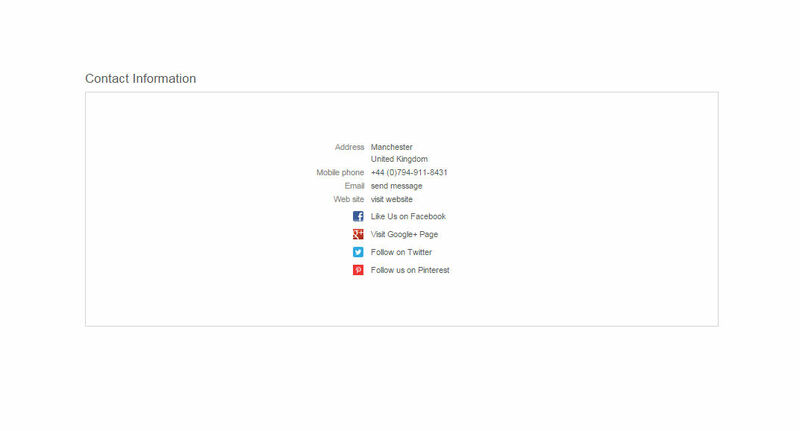 Contact info – contains the usual means of getting in touch along with links to my various social media connections. A notice of copyright although not entirely necessary was included – anything that reminds people intent on stealing or using my content without permission is not necessarily wise. One of the things I learned from putting together a site for myself was that even though I was working from a pre-made template I had a huge amount of control over how the site looked and of the features I could use. Quite often the devil was in the detail and I only learned this from testing the site with friends and of course myself. There were a couple of issues that initially I wasn’t aware of, firstly, that clicking on any navigation menu would open the page in a new tab, very soon I had several tabs open and new this would make a lot of viewers unhappy. Once I knew of the issue I changed my back-office setting to only allow the following pages to open in a new tab – ‘Links’ to my social media connections and ‘My Blogs’ which made sense since this would allow these links to outside websites open in a new tab while leaving mine still open. 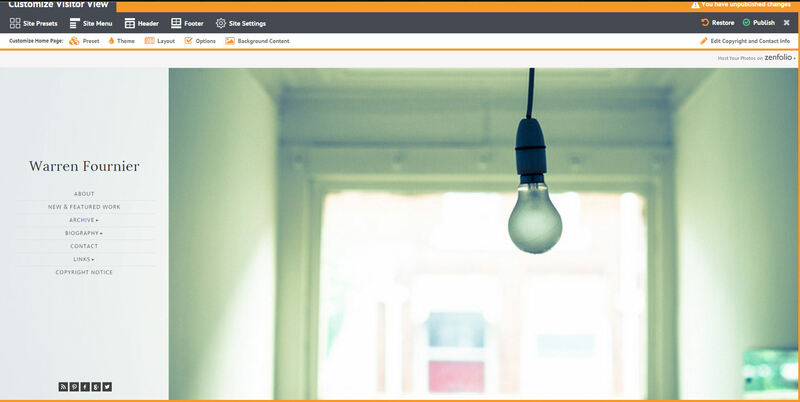 While this sorted out the unneccessary tabs issue, it meant that each gallery took you away from the front page and the navigation links with only the option to use the browser ‘Back’ button. To alleviate any issue with viewers getting lost, I introduced both a ‘Breadcrumb trail’ link at the top of each page, which allowed the viewer to back step to the home page or previous gallery and also a footer with links to the various galleries. 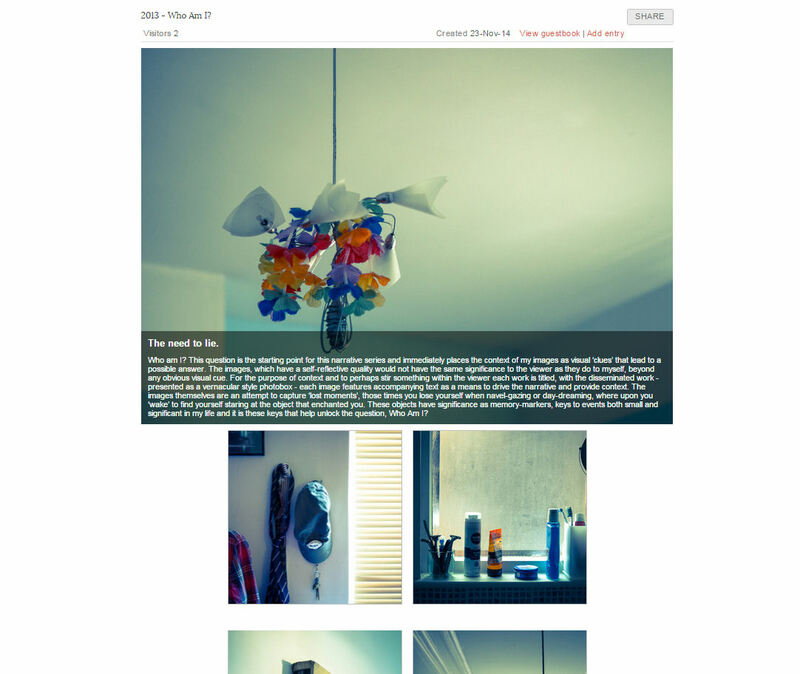 With my website mostly where I want it to be in terms of overall look and feel as well as functionality. I still feel there is room for improvement for the future, with options available to sell my work via the site as well as any changes to layout and viewing options that I deem necessary. On the whole though I am happy with the way the site looks, feels and operates it will just need minor maintenance over time and regular updates to my new & featured section.